© 2002, © 2018 by Paul Freeman. Revised 12/31/18. 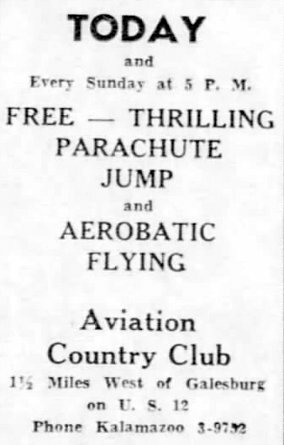 An 8/25/46 advertisement for the Galesburg Aviation Country Club (courtesy of Bill Grasha). as it was not yet depicted on the June 1946 Milwaukee Sectional Chart. 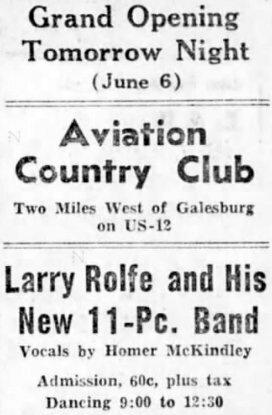 The earliest reference which has been located to the Galesburg Aviation Country Club was an 8/25/46 advertisement (courtesy of Bill Grasha). 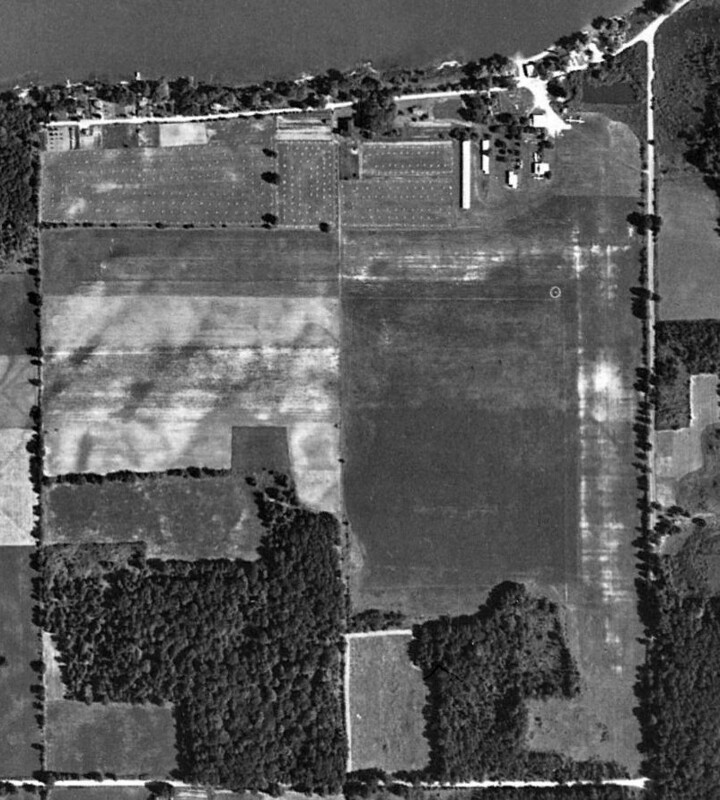 The earliest photo which has been located of Galesburg Aviation Country Club was a 12/1/46 USGS aerial view. It depicted 2 unpaved runways in an “X” shape, with a few small buildings on the north side. oriented northwest/southeast & northeast/southwest, with a clubhouse & office on the north side. 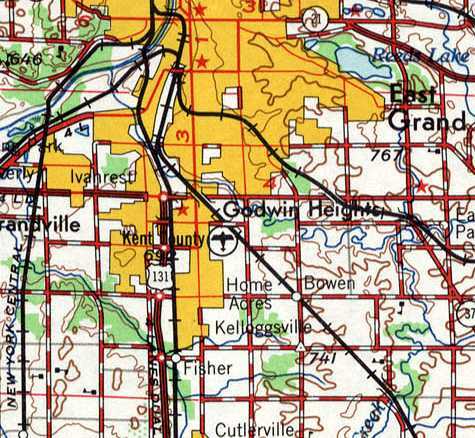 The 1947 USGS topo map depicted Galesburg Aviation Country Club as an unpaved area with several small buildings along the north side. 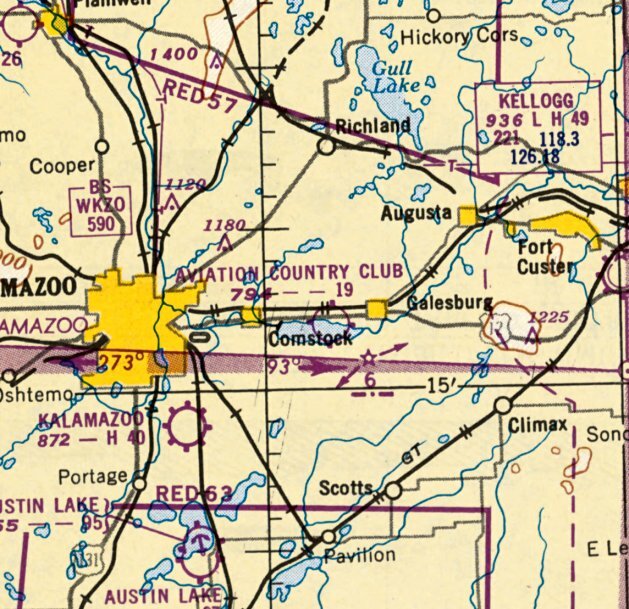 The only aeronautuical chart depiction which has been located of the Galesburg Aviation Country Club was on the May 1950 Milwaukee Sectional Chart. It depicted the Aviation Country Club as having a 1,900' unpaved runway. 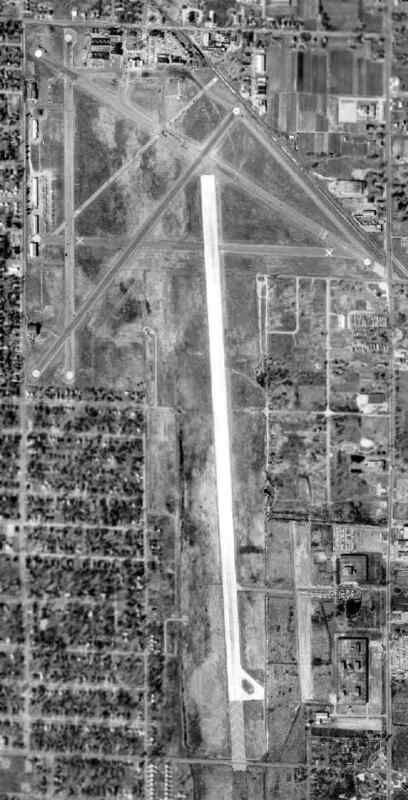 A 1961 aerial photo showed the former airfield area of the Aviation Country Club had been plowed, with runways no longer recognizable. along with the foundation of another building. 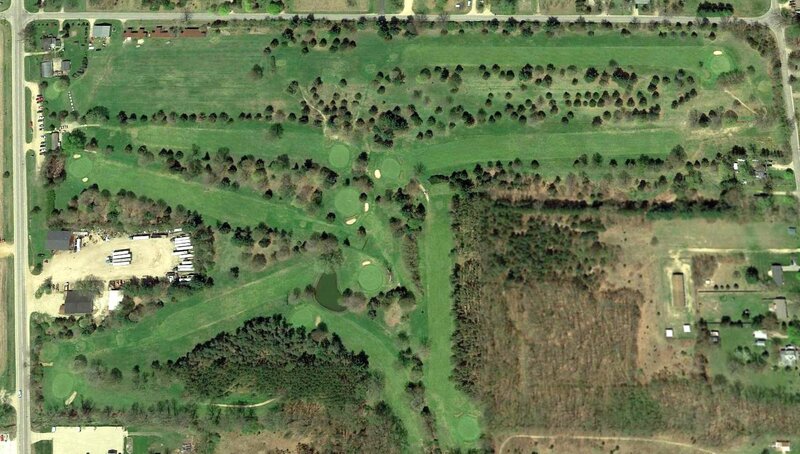 A 2017 aerial view shows no trace remaining of the Galesburg Aviation Country Club. The 1947 MI Airport Directory (courtesy of Bill Grasha) depicted Northside Airport as having 3 unpaved runways. 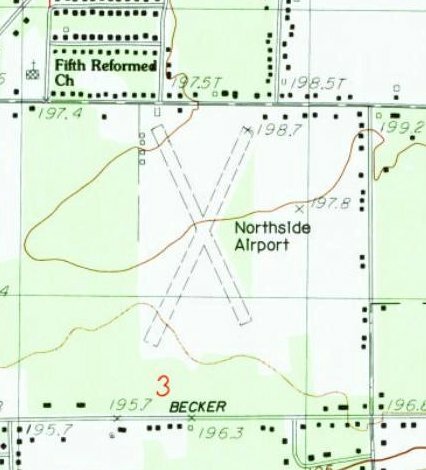 The earliest depiction which has been located of Northside Airport was in the 1947 MI Airport Directory (courtesy of Bill Grasha). It depicted Northside Airport as having 3 unpaved runways, with the longest measuring 2,900' northwest/southeast. A small hangar & office were depicted on the northwest side. 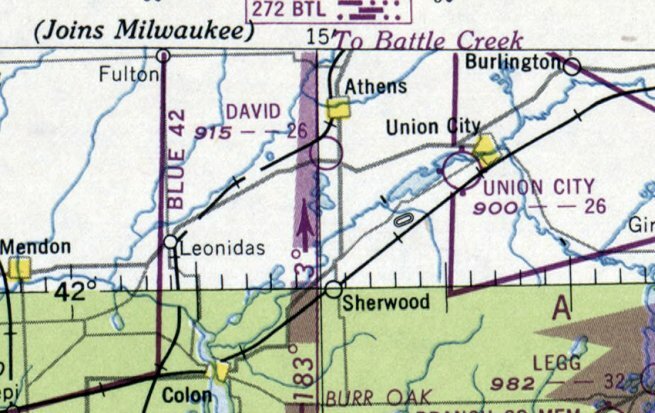 The only aeronautuical chart depiction which has been located of Northside Airport was on the May 1953 Milwaukee Sectional Chart. It depicted Northside Airport as having a 3,200' unpaved runway. The only photo which has been located showing aircraft at Northside Airport was a 1955 aerial view. It depicted 2 light single-engine aircraft parked near a few small hangars on the northwest side. Strangely, Northside Airport was not depicted at all on USGS topo maps from 1960-82. The 1985 USGS topo map depicted Northside Airport as having 2 unpaved runways, with a few small buildings along the north side. though it might have been closed by this point, as there were no aircraft visible on the field. A 2018 aerial view looking east showed the site of Northside Airport being covered by residential cul-de-sacs, and the alignment of 2 runways still partially recognizable. Yet another small American grassroots airport consumed by our insatiable need for more housing. 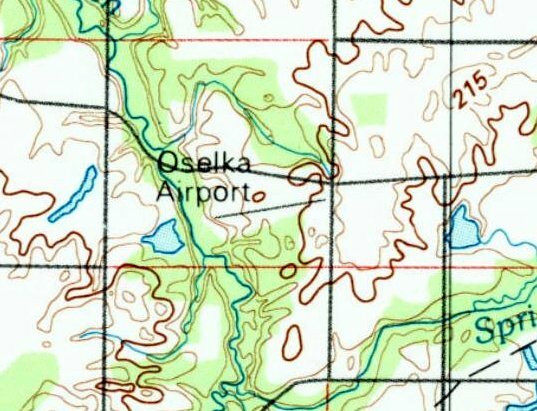 Oselka Airport, as depicted on the May 1965 Chicago Sectional Chart. as it was not yet depicted on the May 1963 Chicago Sectional Chart. 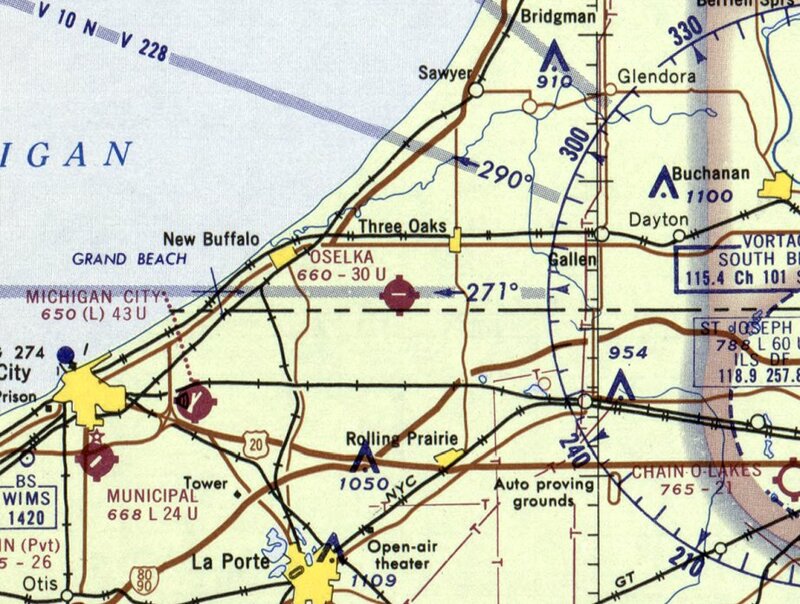 The earliest depiction which has been located of Oselka Airport was on the May 1965 Chicago Sectional Chart. It depicted Oselka Airport as having a 3,000' east/west paved runway. 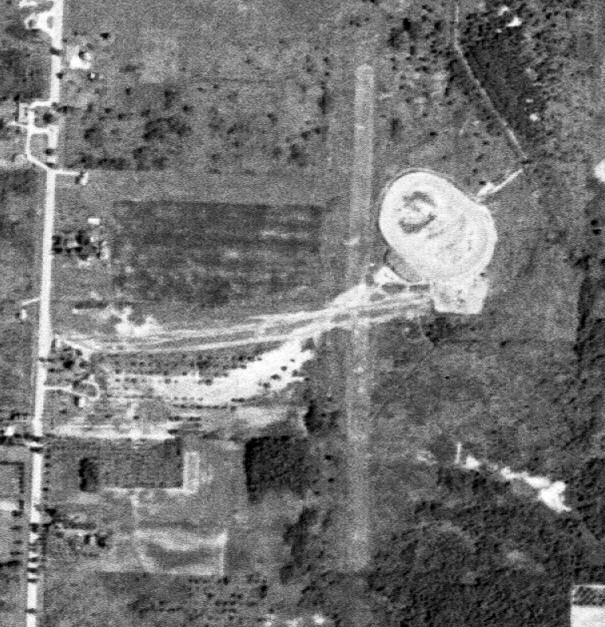 The only photo which has been located showing Oselka Airport in operation was a 4/20/69 USGS aerial view. and a hangar (on whch the lettering on the roof can't be distinguished). 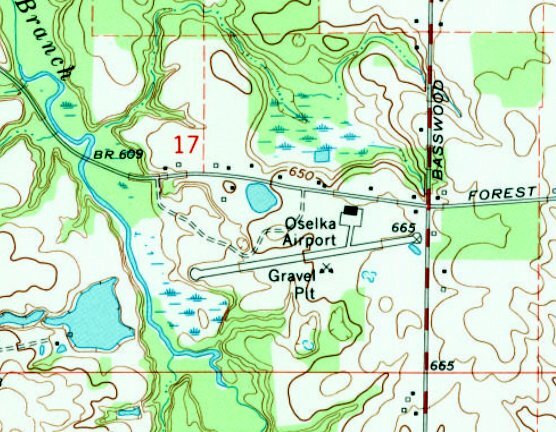 The 1970 USGS topo map depicted Oselka Airport as having a paved northeast/southwest runway, with a paved ramp & 1 hangar on the northeast side. 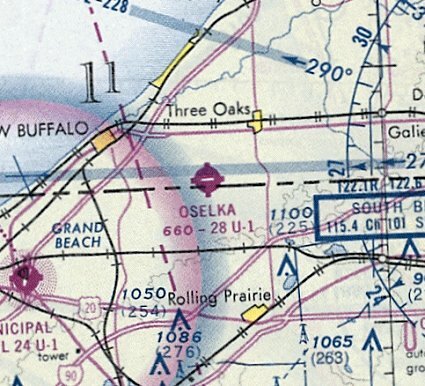 The last aeronautical chart depiction which has been located of Oselka Airport was on the November 1974 Chicago Sectional Chart. It depicted Oselka Airport as having a 2,800' east/west paved runway. which depicted it as having a northeast/southwest paved runway. as it was no longer depicted on the October 1993 Chicago Sectional Chart. but the runway had been removed & the airfield area recountored – possibly reused for surface mining? A 2016 aerial photo showed the Oselka Airport hangar remained standing, but no trace remained of the runway. 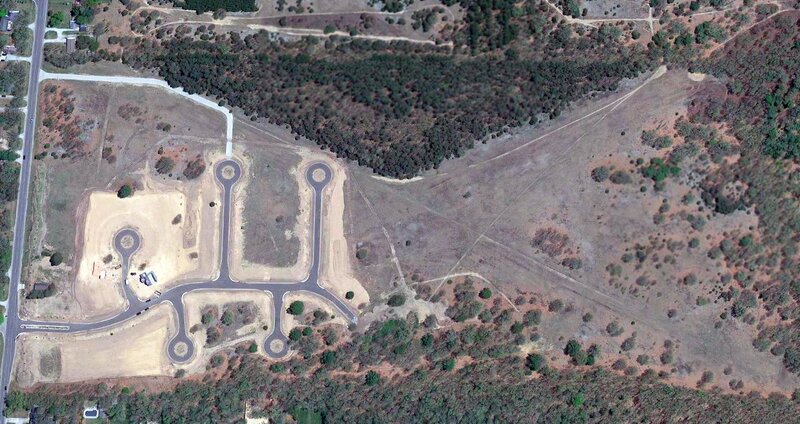 Thanks to Scott Stribrny for pointing out this airfield. The 1947 MI Airport Directory (courtesy of Bill Grasha) depicted Grand River Airpark & Seaplane Base as having 3 unpaved runways. Before a very brief stint as an airport, this property was the site of the West Michigan Fair. 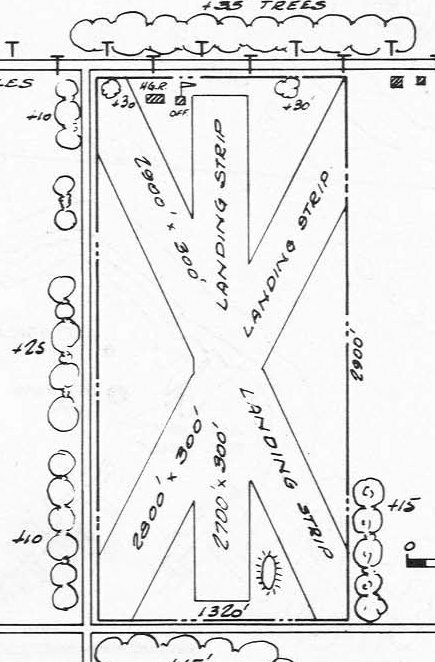 Grand River Airpark was not yet depicted on the June 1946 Milwaukee Sectional Chart. “In 1946 after World War II ended, the nation's craze turned to airplanes, because so many were involved with aircraft during the war. Visionary O. C. Hall gambled on a 50 year lease with an option to purchase the fairgrounds & built a north/south runway with a seaplane base on the river. 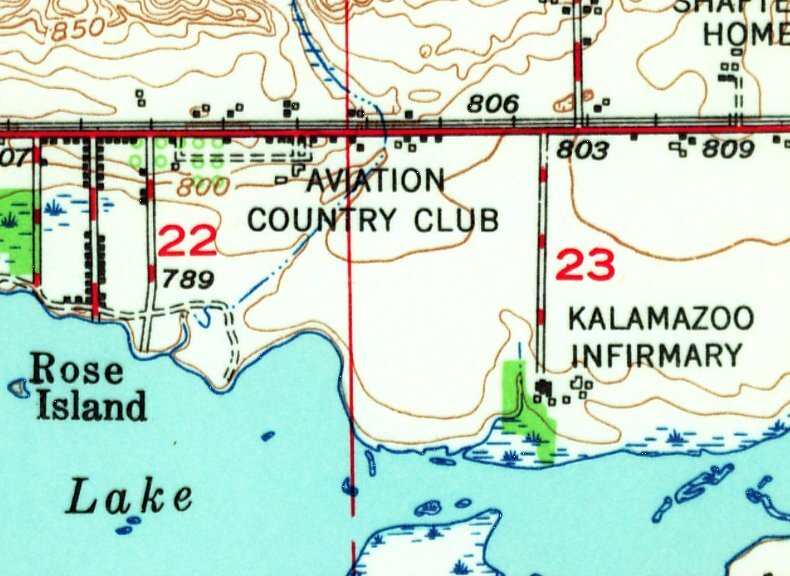 The earliest depiction which has been located of Grand River Airpark & Seaplane Base was in the 1947 MI Airport Directory (courtesy of Bill Grasha). 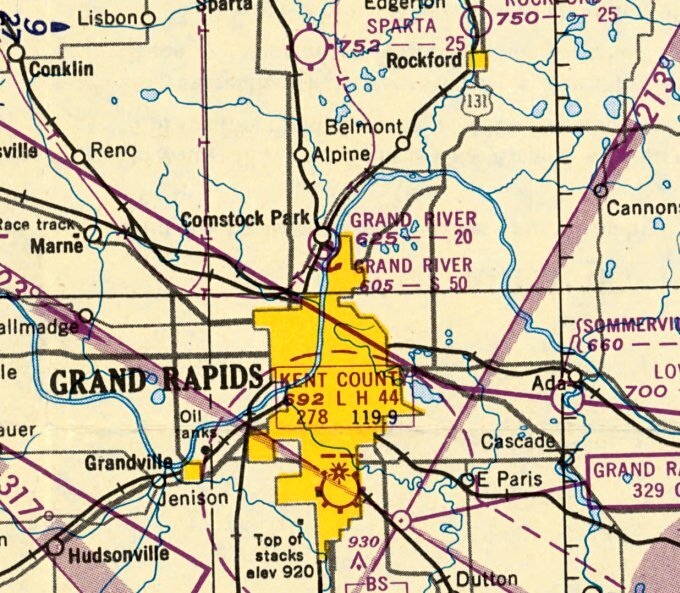 It depicted Grand River as having 3 unpaved runways, with the longest measuring 3,000' north/south. A main hangar & office were on the southwest side, with some T-hangars on the northwest side, and the seaplane ramp & seaplane base office along the Grand River on the southeast side. 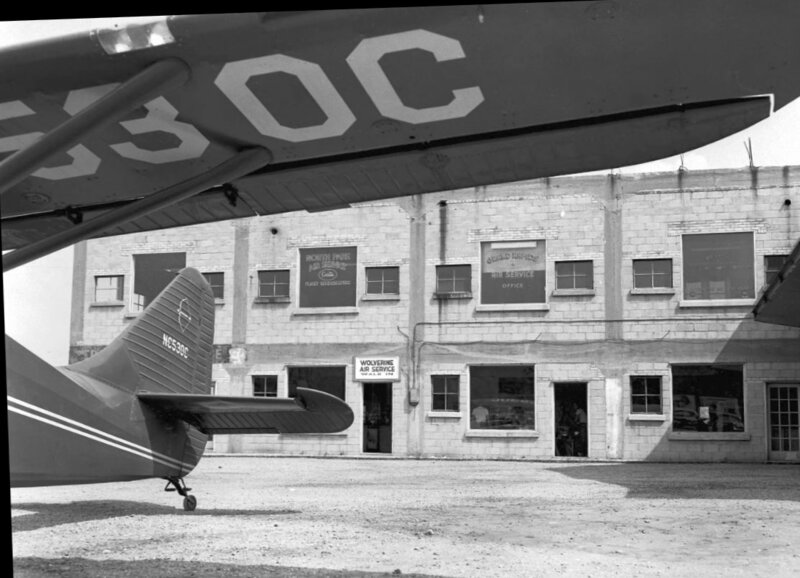 of a Stinson 108-3 in front of a 2-story building housing the North Park Air Service, Wolverine Air Service, and Grand Rapids Air Service. as work was started on a multi-purpose racing facility with modern conveniences close in to Grand Rapids. it continued to be depicted on aeronautical charts & topo maps as an operating airport for a few more years. 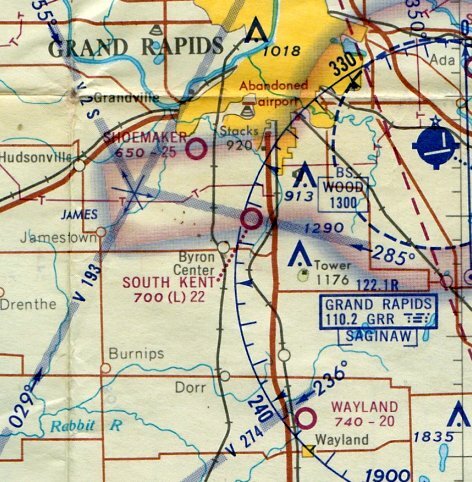 The earliest aeronautical chart depiction which has been located of Grand River Airpark was on the May 1950 Milwaukee Sectional Chart. It depicted Grand River as having a 2,000' unpaved runway & a seaplane base. 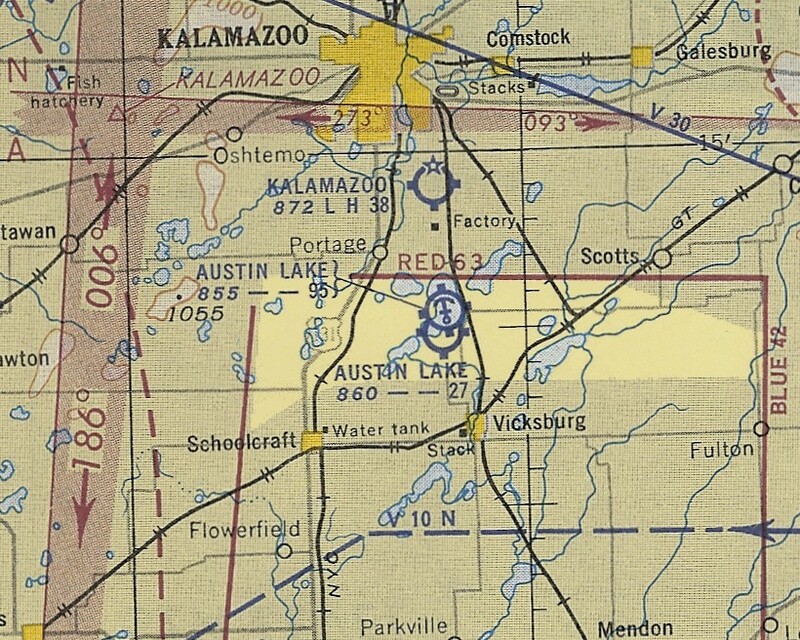 The last aeronautical chart depiction which has been located of Grand River Airpark was on the May 1955 Milwaukee Sectional Chart. It depicted Grand River as having a 2,000' unpaved runway, but the seaplane base was no longer depicted. 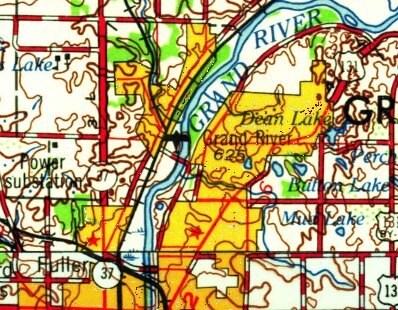 The last depiction which has been located of Grand River Airpark was on the 1958 USGS topo map. in which the trace of the northeastern portion of one runway was still visible (bottom-right). 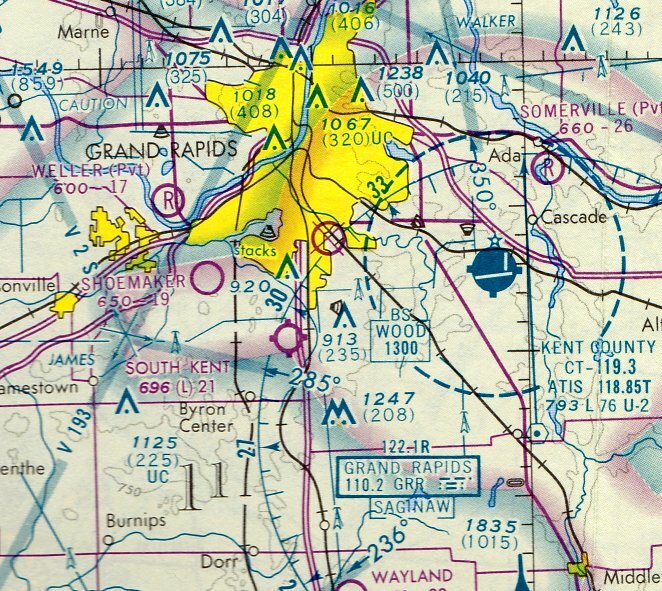 Grand River Airpark was no longer depicted on the May 1960 Milwaukee Sectional Chart. 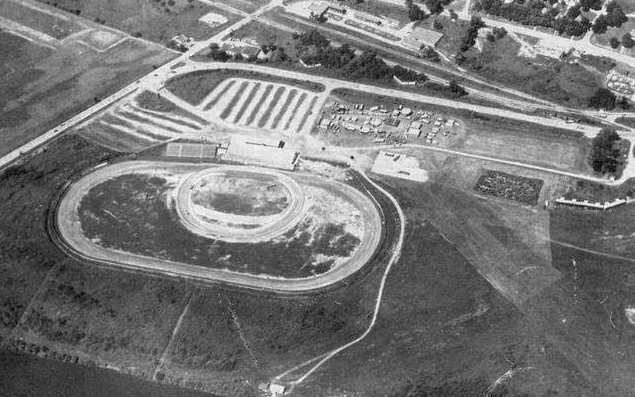 A 1965 aerial photo depicted the oval Speedrome occupying the site. Traces of the northeast/southwest runway were still apparent. 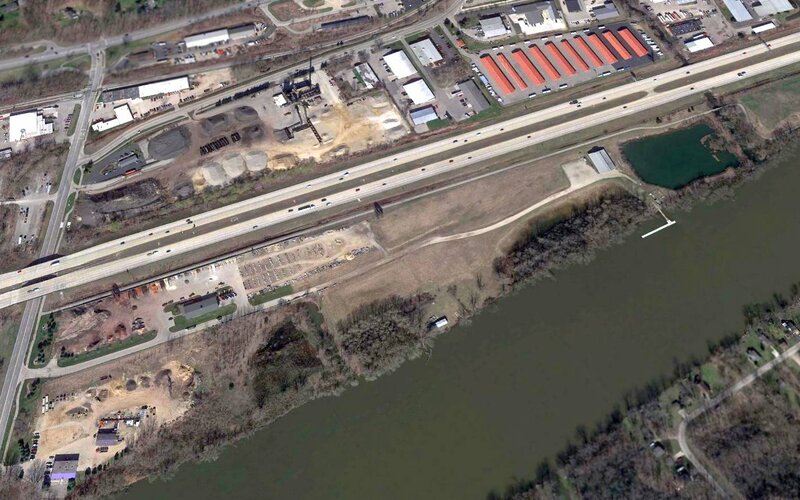 A 2016 aerial view looking northwest showed no trace of the Grand River Airpark & Seaplane Base, or even of the Speedrome which replaced the airport. The 1947 MI Airport Directory (courtesy of Bill Grasha) depicted David Airfield as having 2 unpaved runways. The earliest depiction which has been located of David Field was in the 1947 MI Airport Directory (courtesy of Bill Grasha). It depicted David Field as having 2 unpaved runways, measuring 2,600' east/west & 2,400' northeast/southwest. A house, office, and one other small building were depicted on the southwest. which depicted David Field as having a 2,600' unpaved runway. 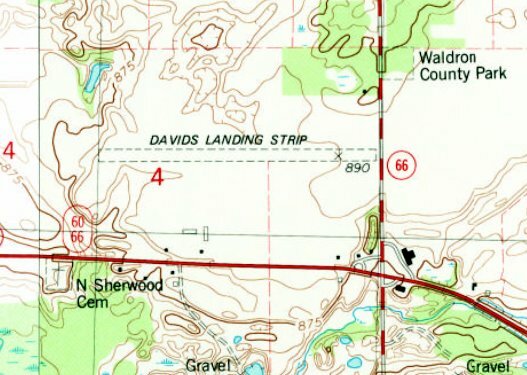 The 1982 USGS topo map depicted “David's Landing Strip” as having one east/west unpaved runway, with a few small buildings to the south. Dan Lux recalled, “Davids Airfield... My father was the airport manager from about 1985 thru the end & lived in the house on the property. I grew up there. It was a fantastic place to grow up - my father was a pilot & owned a PA22 Piper Pacer. It was weekends full of Dawn Patrols & family trips. I learned to drive on that runway & I learned to ride motorcycles as well. At one point there were 2 hangar buildings, a north/south & an east/west. I soloed at that field & it will always have a special place in my heart. My father Leo Lux II purchased the house & the 2 acres the house sat on from John Broberg in the mid-1980s with the agreement that he would manage 9C2 after John retired. The airport & surrounding farmland was sold to Larry Yoder, a Mennonite farmer & longtime friend & associate of John Broberg. Larry was a pilot & kept the airport intact & just farmed the fields around it. For a decade WMU used it to train their pilots & they referred to the place as 'Going to shoot the field goal' because of the breaks in the treelines at both sides it looked like a field goal. In the summers we would have the Athens burnt chicken BBQ & the northwest taxiway would be lined up with parked airplanes. 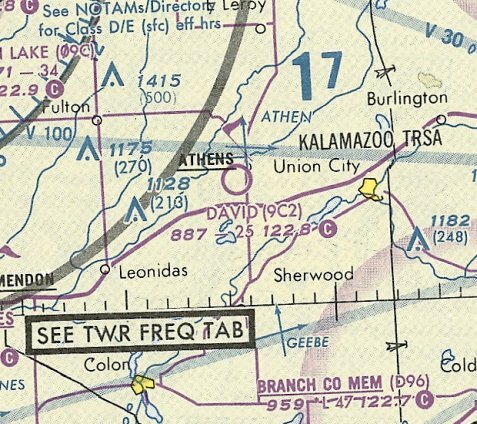 The last aeronautical chart depiction which has been located of David Field was on the October 1993 Chicago Sectional Chart (courtesy of Ron Plante). It depicted David Field as having a 2,500' unpaved runway. 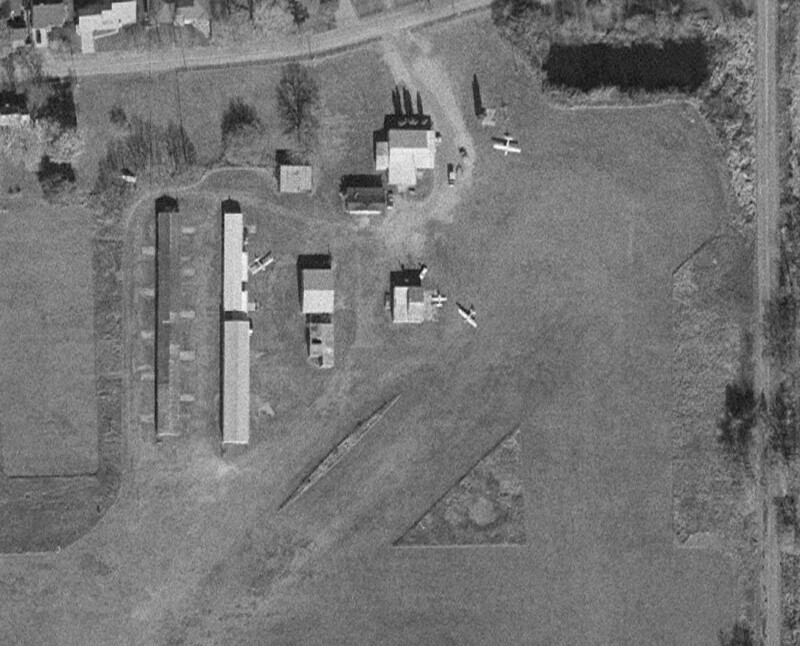 The earliest photo which has been located showing an aircraft at David Field was a 1999 aerial view looking north. 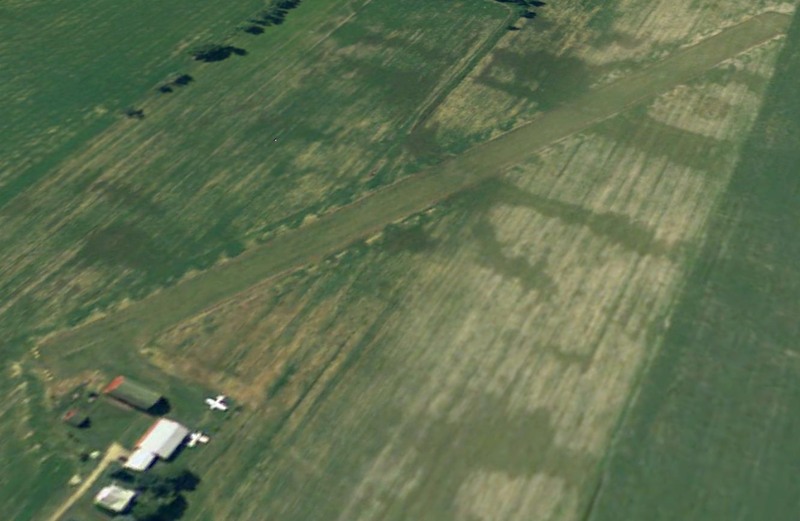 It depicted David Field as having an east/west grass runway, with no sign of the previous crosswind runway. One light single-engine aircraft was visible parked near a few small buildings on the south side, including 2 hangars. According to its FAA Airport/Facility Directory data, as of 2005, David's Airport was owned by Mike Abu-Reezeq, consisted of 9 acres, and had one 2,500' turf Runway 9/27. It conducted an average of 83 general aviation takeoffs & landings per month. A 2006 aerial view showed the David Field runway appeared to still be maintained. 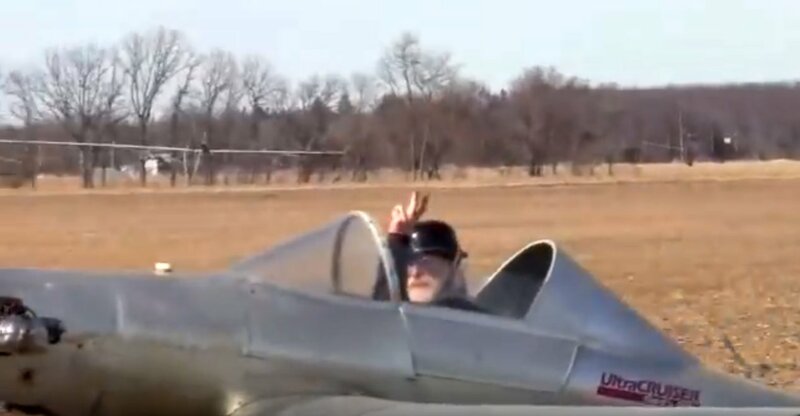 The last images which have been located showing an aircraft at Davids Field was an early Spring 2011 video by Dan Lux of his father Leo Lux II waving from his Tin Bird ultralight after having landed at Davids Field. A still image from an early Spring 2011 video by Dan Lux of his father Leo Lux II taxiing his Tin Bird ultralight past a Davids Field hangar. A 2011 aerial view showed the David Field runway appeared to be in the process of being plowed up. and then leased the farming land back to one of the Mennonites in the area who happened to be Larry Yoders son-in-law. Mike Abu-Reezeq failed to pay his property taxes to the state & ended up getting the land seized. The Mennonites then stepped up to purchase the land on a tax sale & since Larrys son-in-law did not fly & had no interest in a airport [they] decided to plow her under. 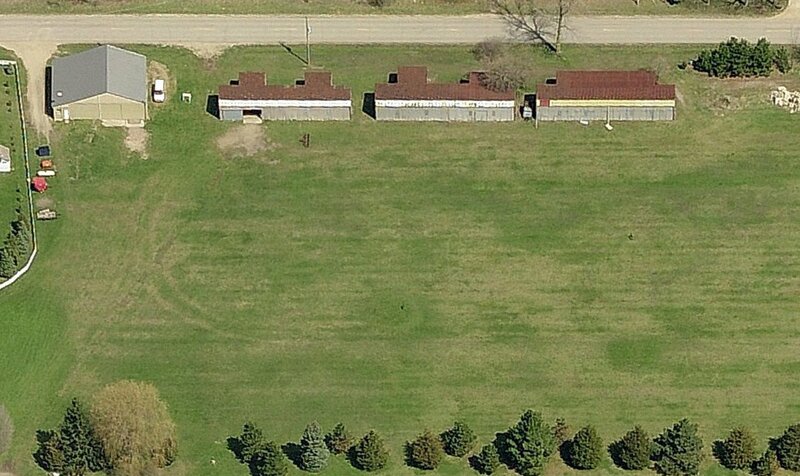 It was a sad day & tragic loss of a historical site & at one time 9C2 was voted nicest grass strip in MI. The airport was plowed under in late 2012 – a sad day made a lot of people very sad to see her go. Davids Airfield was a fantastic airport! A 2017 aerial view looking north at the site of David Field showed it to be unrecognizable as a former airfield, with the runway area having been returned to cultivation. One possible former hangar remained intact on the south side. A 10/20/40 postmark commemorating the dedication of Marks' Field (courtesy of Mike Denja). 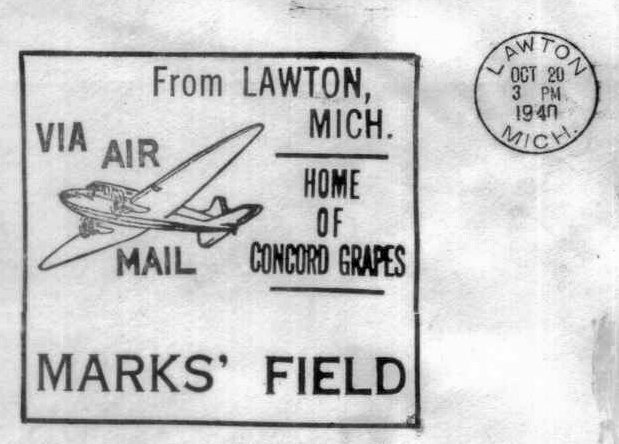 The dedication of this small general aviation airport on the north side of the town of Lawton was commemorated by a 10/20/40 postmark (courtesy of Mike Denja). 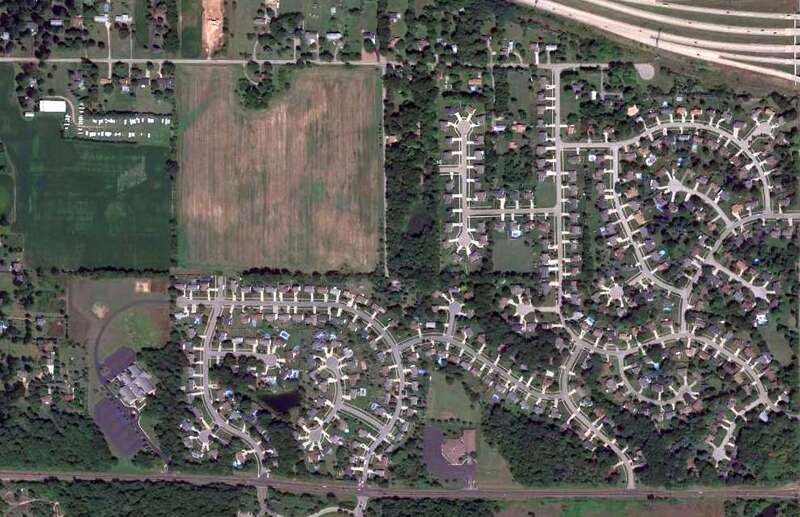 which depicted an irregularly-shaped property outline, labeled simply as “Airport”. 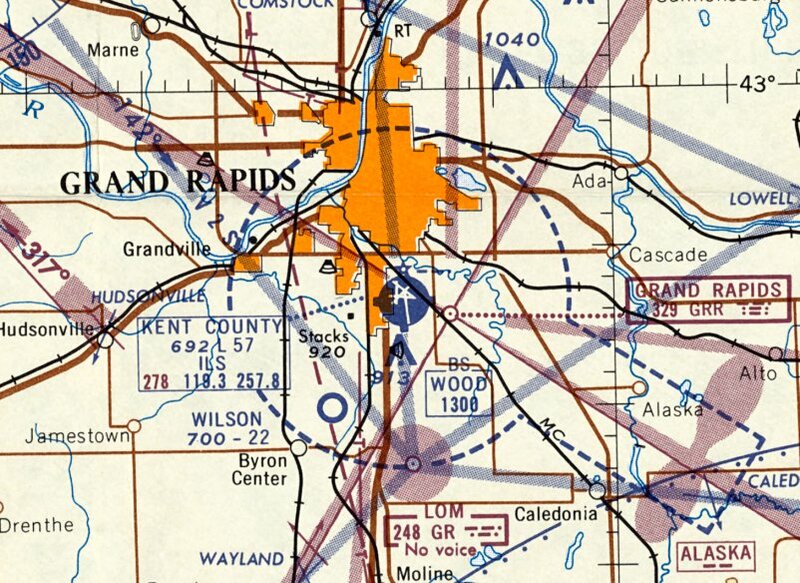 The 1947 MI Airport Directory (courtesy of Mike Denja) depicted Marks' Field as having 3 unpaved runways, with the longest being the 2,500' east/west strip. A single hangar was depicted on the northwest side. 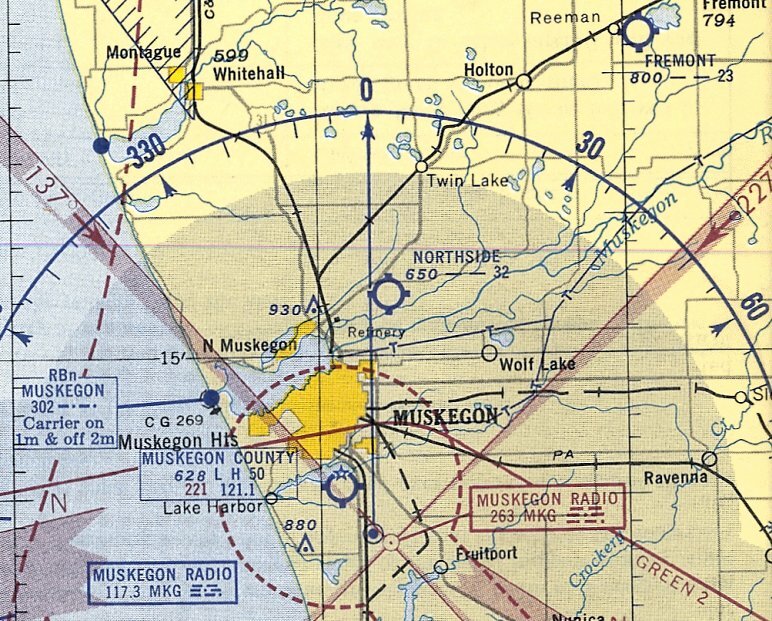 The earliest aeronautical chart depiction which has been located of Marks Field was on the May 1953 Milwaukee Sectional Chart (courtesy of Ron Plante). It depicted Marks Field as having a 2,500' unpaved runway. 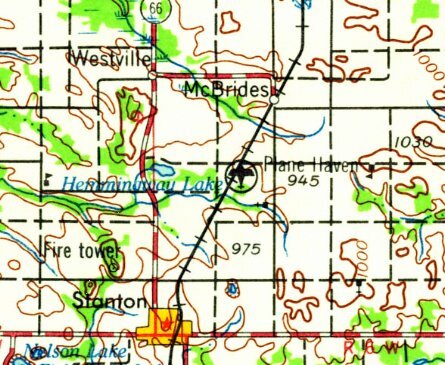 Marks Field was still depicted on the 1962 USGS topo map. The last aeronautical chart depiction which has been located of Marks Field was on the October 1970 Chicago Sectional Chart (courtesy of Ron Plante). as it was no longer depicted on the November 1974 Chicago Sectional Chart (courtesy of Ron Plante). A circa 2010-2017 aerial view looking north at the former T-hangars which remain along the northwest side of the site of Marks Field. A circa 2010-2017 photo looking northeast at the former T-hangars which remain along the northwest side of the site of Marks Field. A 2017 aerial view of the site of Marks Field shows the former T-hangars which remain along the northwest side of the property, which otherwise is covered by a golf course. As of 2017, the site of Marks Field was depicted on street maps as Pin High Golf Club. 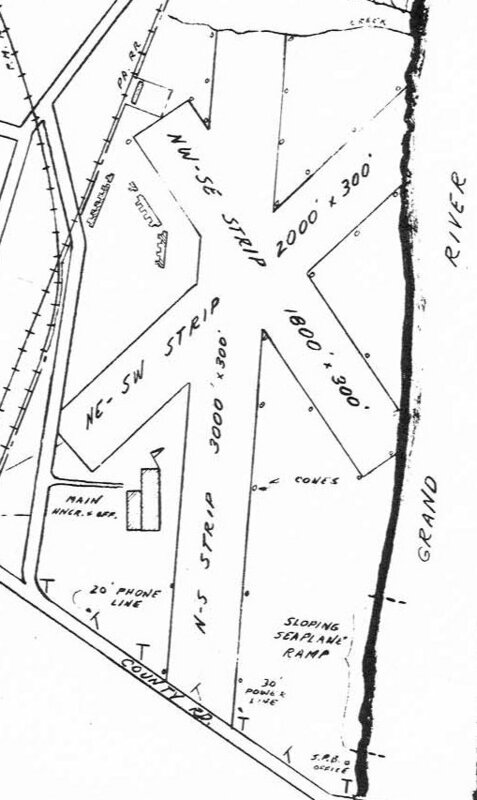 The site of Marks Field is located southeast of the intersection of North Main Street & 66th Avenue. The location & layout of Plane Haven Airport, as depicted in the 1947 MI Airport Directory (courtesy of Bill Grasha). as it was not yet depicted on the May 1947 Milwaukee Sectional Chart (courtesy of Ron Plante). The earliest depiction which has been located of Plane Haven Airport in the in the 1947 MI Airport Directory (courtesy of Bill Grasha). It depicted Plane Haven as having 3 unpaved runways, with the longest being a 3,300' east/west strip. A single hangar was located on the southeast side. 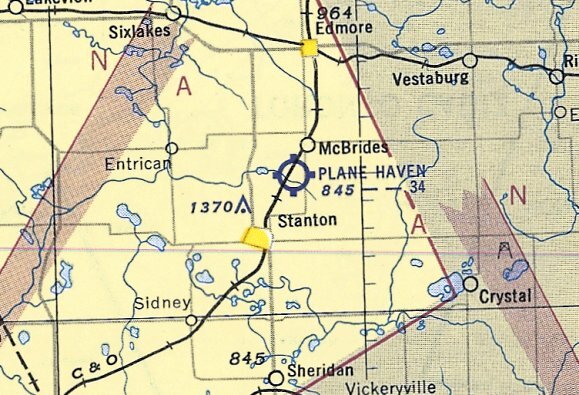 The only aeronautical chart depiction which has been located of Plane Haven Airport was on the May 1953 Milwaukee Sectional Chart (courtesy of Ron Plante). It depicted Plane Haven as having a 3,400' unpaved runway. The last reference which has been located of Plane Haven Airport was an article (courtesy of Bill Grasha) describing the Montcalm Soil Conservation District's 1953 Air Tour. as its location was reused as a dragstrip, Central Michigan Dragway. According to dragstriplist.com, “Central Michigan Dragway began operation at least as early as 1955. 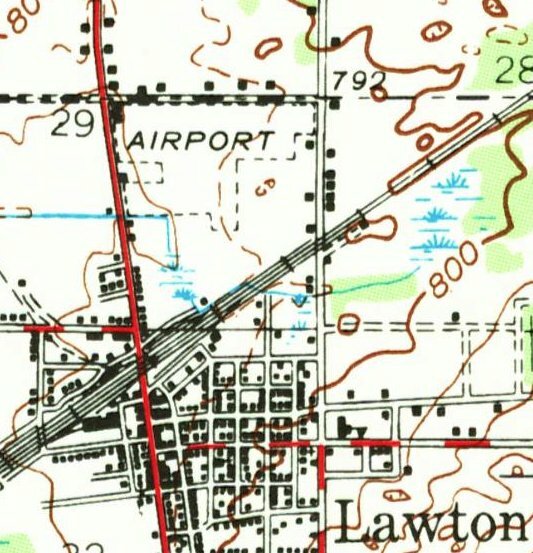 Plane Haven Airport was still depicted on the 1959 USGS topo map, even though it had evidently been replaced by a dragstrip 4 years prior. along with the airport circle marking on the southeast side. A single building on the southeast side may have been a former hangar. but the trace of the southwest end of the southwest/southeast runway remained perceptible at bottom-left. As of 2017, the site of Plante Haven Airport is depicted on street maps as Mid Michigan Motorplex. The site of Plane Haven Airport is located southwest of the intersection of Wyman Road Northeast & East Cannonsville Road. 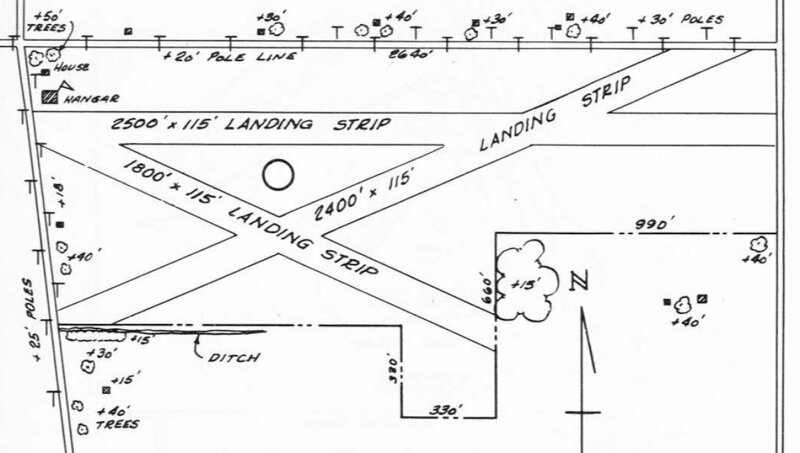 Austin Lake Airport & Seaplane Base, as depicted on the July 1942 Minneapolis Sectional Chart. “The Austin Lake Airport was constructed on the old Woodhams farm in the 1920s by Irving Woodhams, a local aviation pioneer. "Irving & his wife Dorothy, also a professional commercial & private pilot, owned & operated the Austin Lake Airport & Seaplane Base from 1938. 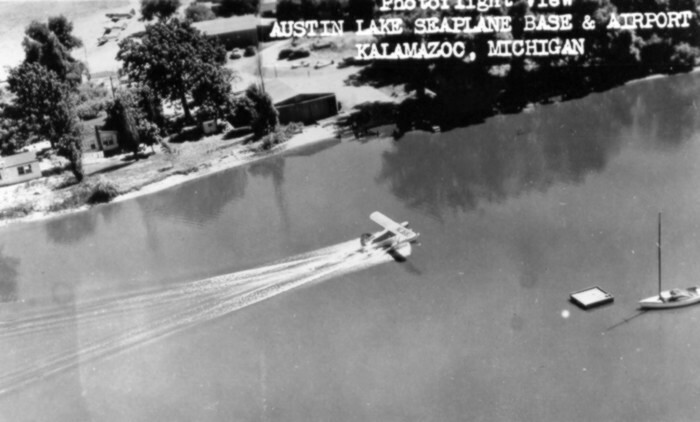 For a time, the Austin Lake Airport was the only seaplane base in Michigan. He developed that airport on training Navy students who were continuing on in aviation. That's what he did during the war, said Donald Woodhams. Doing everything correctly was a real bug with him. Irving, known for his attention to detail, ensured that the planes flying out of his airports had perfect safety records, a remarkable feat for the time." 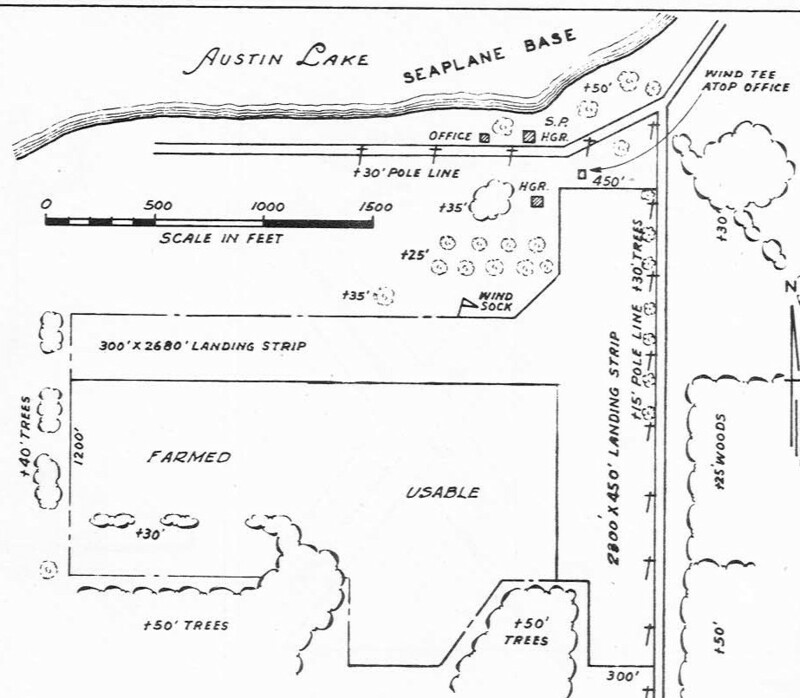 It described Austin Lake Airport as having 2 perpendicular sod runways, measuring 2,680' east/west & 2,300' north/south. A circa 1940s aerial view of a single-engine floatplane (model unidentified) making a water takeoff or landing at Austin Lake Seaplane Base (courtesy of Bill Grasha). measuring 2,680' east/west & 2,300' north/south, with a hangar, office, and seaplane hangar on the north side. with 5 light single-engine aircraft parked near some small hangars on the northeast side. An undated (circa 1950s?) photo of “Doug & his Piper Cub at Austin Lake Airport” (courtesy of Bill Grasha). 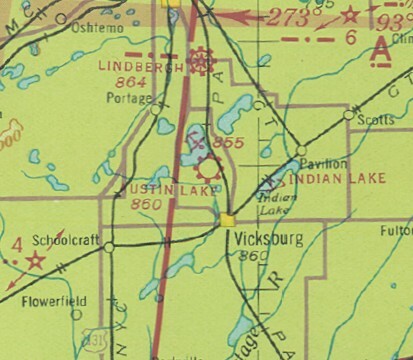 The last aeronautical chart depiction which has been located of Austin Lake Airport & Seaplane Base was on the May 1953 Minneapolis Sectional Chart. It depicted Austin Lake Airport as having a 2,700' unpaved runway. "Irving & his wife Dorothy owned & operated the Austin Lake Airport & Seaplane Base until retiring in 1963." 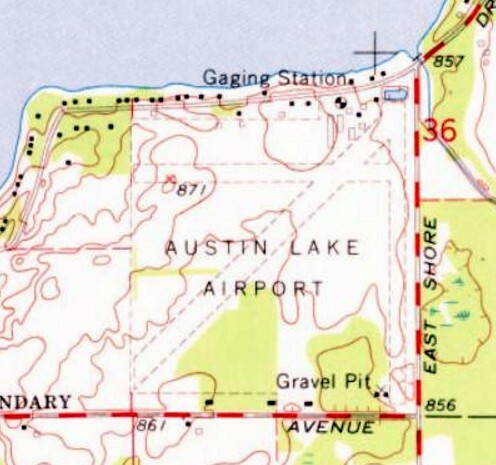 The 1967 USGS topo map shows Austin Lake Airport gained a 3rd unpaved runway at some point between 1950-67. Several small buildings were depicted on the northeast side. A 1974 City of Portage aerial view depicted Austin Lake as having 3 grass runways, with 2 light single-engine aircraft parked near some small hangars on the northeast side. 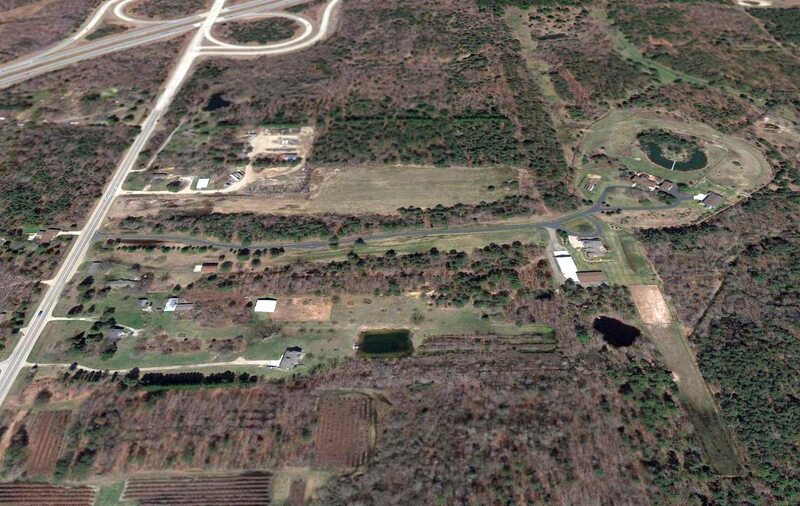 The last photo which has been located showing aircraft at Austin Lake Airport was a 1989 City of Portage aerial view. A closeup showing 4 light single-engine aircraft at Austin Lake Airport from the 1989 City of Portage aerial view. A circa 2010-2017 aerial view looking west shows several hangars remain standing at the site of Austin Lake Airport. and several former hangars remained standing on the northeast side. The site of Austin Lake Airport is located southwest of the intersection of Woodhams Avenue & East Shore Drive. A 6/21/46 advertisement announcing the opening of Saugatuck-Douglas Airport (courtesy of Bill Grasha). “In June of 1946 an airport opened for business just south of Douglas, called the Saugatuck-Douglas Airport. In addition, a small restaurant, known as 'The Airport Grill' served light lunches. It had two 2,500' packed-dirt runways. In July local pilots joined together to paint the roof of a building in each town with the name of the village & directions & distance to the airport. The historical society article continued, “Harl Schneider was one of the earliest licensed pilots in the United States. One of his students, who had seen Schneider's pilot's license, said that the number on it was less than 100 and it was issued in 1920 or 1921. Schneider had taught flying at an airport near Holland until he & Lucille were married & opened the Douglas facility. She was also a pilot. They bought the old John Flagg farm just south of Douglas & Albert Crane of Fennville graded the runways. Because of the hardpan clay formations there was some difficulty in getting the runways to drain properly. Crane solved the drainage problem by drilling a 5 or 6' hole in the problem areas & setting off a stick of dynamite to loosen up the hardpan, then smoothing it over. A 9/20/46 advertisement for flight training at Saugatuck-Douglas Airport (courtesy of Bill Grasha). The earliest depiction which has been located of Saugatuck-Douglas Airport was in the 1947 MI Airport Directory (courtesy of Bill Grasha). with an office, restaurant, and 2 T-hangars on the west side. The historical society article continued, “The airport was officially known as the Saugatuck-Douglas airport, but some bills made out to the facility use the name Douglas Lakeside Airport. Mail was received from the Fennville post office, leading to some confusion. Flying instruction was carried on by Harl & Lucille Schneider under the name of 'Sky High Flying Service' according to a letterhead. They had 2 or 3 Aeronca airplanes, 2-seaters with one used by the instructor & another by the student, all painted bright yellow. In addition, in April of 1948 the Schneiders purchased a 4-place Stinson for their own use & to give scenic rides. The plane was brought to Douglas from Pine Bluff, AR, one of the longest flights recorded in the airport logs. More common destinations were Manistee, Mackinaw City, Kalamazoo, and other small airports in MI & IN. Records show that planes frequently flew to Muskegon for repairs & maintenance. During World War II many men flew planes who had never even ridden in one before, and many others were exposed to the miracle of flight. and would also pay for the flying course that resulted in a private pilot's license in the interest of 'Vocational Rehabilitation'. Pilots who had earned their wings flying military planes were another source of income as they adapted their skills to civilian life or simply revisited the thrill of flying without the combat responsibilities. Payment directly from the federal government for veterans taking private pilot training was one of the major sources of income for the airport. 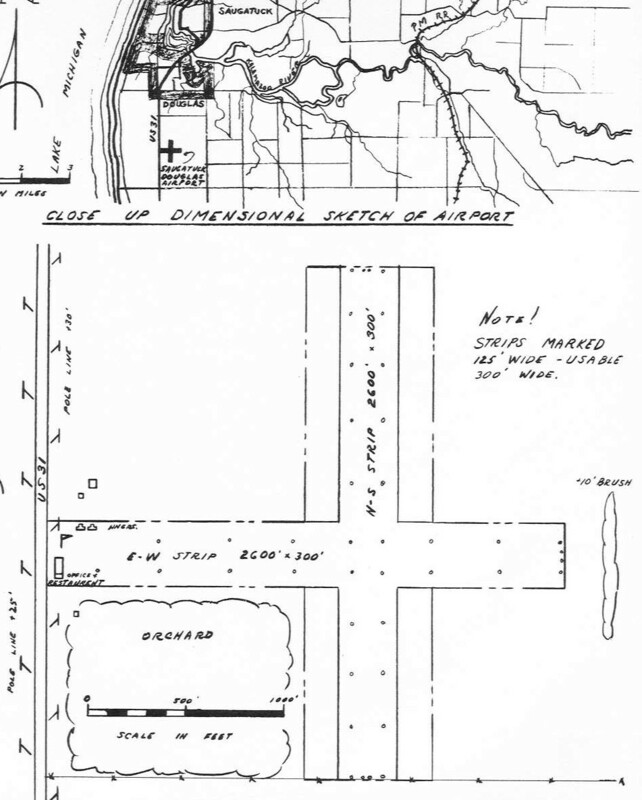 The 1950 Airman's Guide described Douglas-Saugatuck Airport as a commercial facility, having 2 runways, the longest being 2,600', and storage facilities, and fuel. “Albert Crane said he remembers the first day the fuel tank was filled. He had dug the hole, the tank was installed & covered. That evening the West Michigan Oil Company truck had put some gas in it, but did not have sufficient in the truck to completely top it off. That night the first really big rain of the season struck the area & the water-soaked ground began to swell. The tank came up out of the ground, with the pump on top. Lloyd Dornan, one of the former students, sometimes gave rides to tourists & was at the airport one day when radio broadcaster Paul Harvey flew in. The historical society article continued, “When students under the GI Bill had finished their flying courses, there were not enough local people seeking lessons to make ends meet. The airport stayed open for several more years, at least as late as 1951, but was used only by a few local people who owned their own planes & an occasional transient. Harl & Lucille Schneider separated & Lucille married Chester Downer, also a pilot, but who also had an interest in auto racing. About 1952 they called Crane & asked him to build an auto racing track near the back of the property, essentially behind the airport runways. In addition to the quarter-mile dirt track Crane built bleacher seating on banks of earth. The wooden planks that customers sat on were held in place with stakes. It was considered safer than conventional bleachers because customers could not fall through. 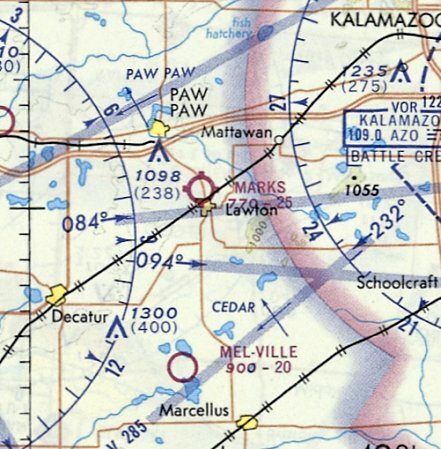 The only aeronautical chart depiction which has been located of Saugatuck-Douglas Airport was on the May 1953 Milwaukee Sectional Chart (courtesy of Ron Plante). It depicted Saugatuck-Douglas Airport as having a 2,600' unpaved runway. 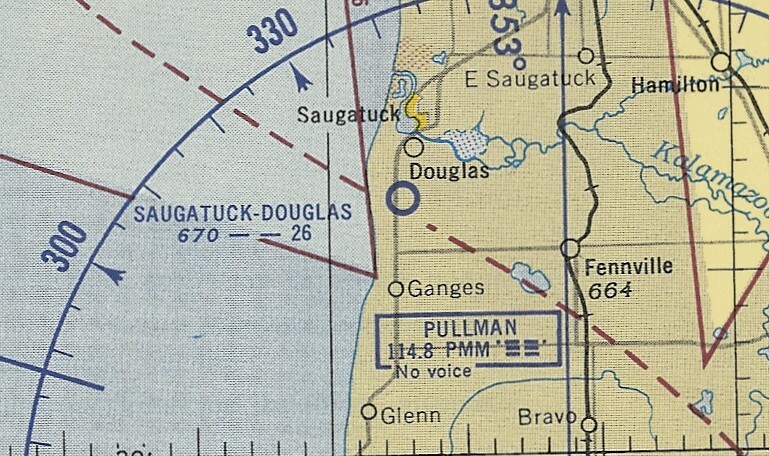 The Saugatuck-Douglas Airport was not depicted on the 1955 USGS topo map. 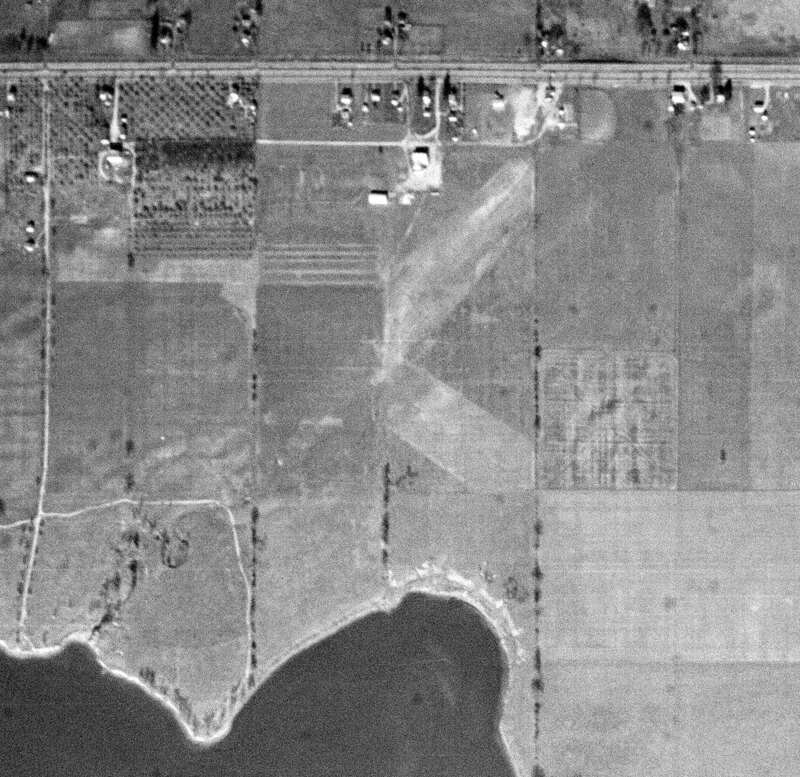 The earliest photo which has been located of Saugatuck-Douglas Airport was a 7/30/56 USGS aerial view. 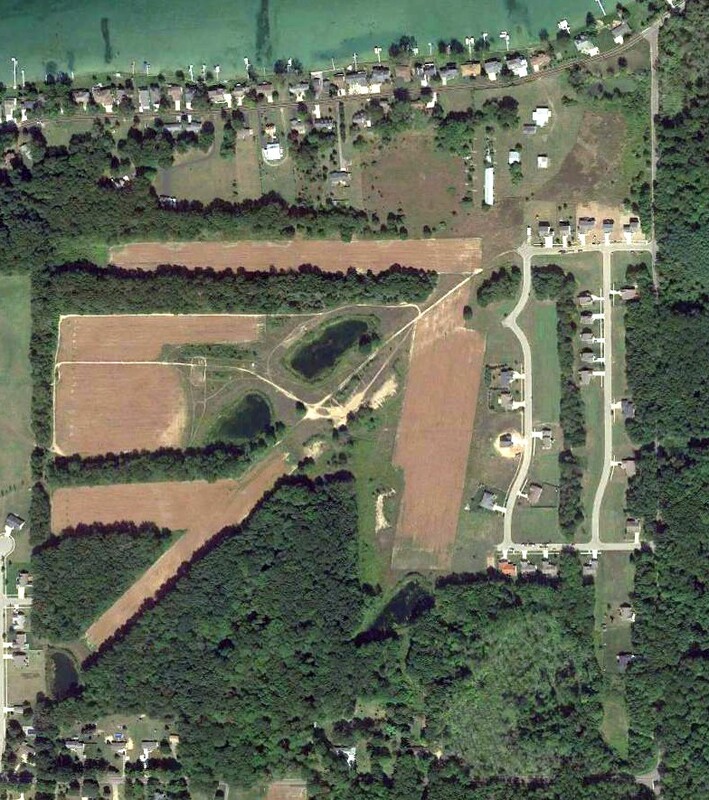 It depicted Saugatuck-Douglas Airport as having 2 unpaved runways, with a few small buildings on the west side. and presumably the airport had ceased to function by that point. “Portions of the land were later sold as home sites. The building that housed the old Airport Grill still exists remodeled as a residence. 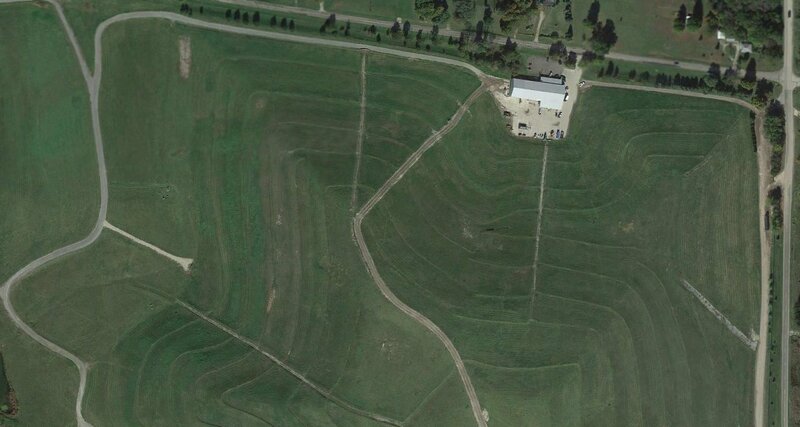 along with the oval outline of the former Airpark Speedway on the northeast side. 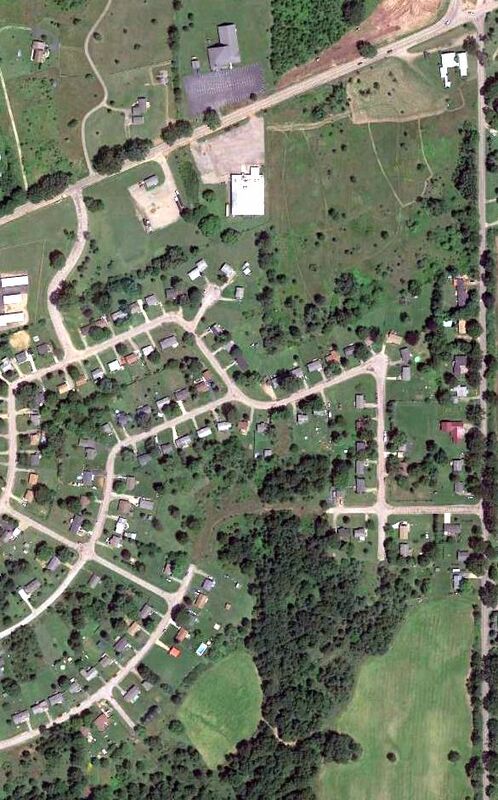 The site of Saugatuck-Douglas Airport is located northeast of the intersection of Blue Star Highway & Maple Lane. The location & layout of Morgan Field, as depicted in the 1947 MI Airport Directory (courtesy of Bill Grasha). Morgan Field was not yet depicted on the June 1946 Milwaukee Sectional Chart. 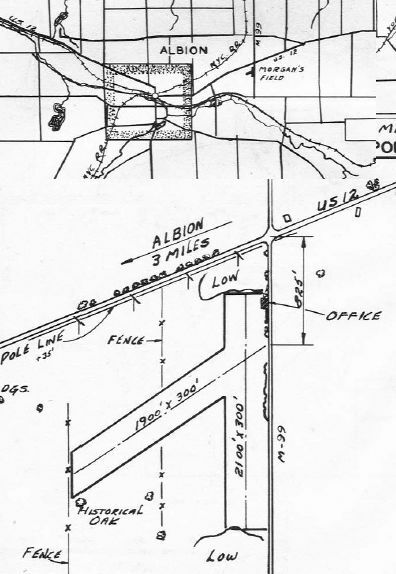 “Albion’s airport once consisted of a 40-acre site, developed by Stanley Morgan in June 1946. 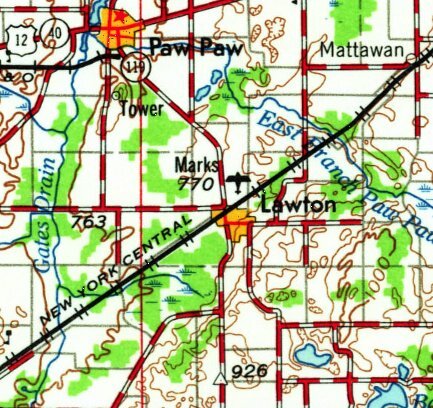 The airport was located southwest of M-99 & old U.S.12. “The airport’s main office & hangar was located on Finley Road. Morgan gave flying lessons & promoted the sport in the Albion area. There were 2 runways. The main one ran northeast/southwest, and the secondary one north/south. Frank continued, “There was a flying club called the Skyrangers, consisting of about 20 flying enthusiasts. The group owned a 1946 Piper Cub, a 2-seat plane. which included 2 light craft assigned to the MI National Guard’s 943rd Field Artillery Battalion under the command of Lt. Colonel Noble Moore. The earliest dated depiction which has been located of Morgan Field was in the 1947 MI Airport Directory (courtesy of Bill Grasha). It depicted Morgan Field as having 2 unpaved runways, measuring 2,100' north/south & 1,900' northeast/southwest. An office was depicted on the northeast corner. 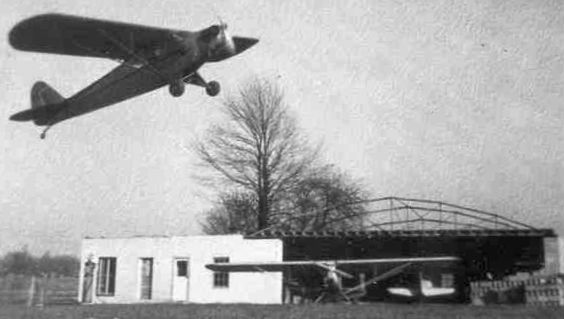 A circa 1946-51 photo (courtesy of Bill Grasha) of a Piper Cub overflying a the Morgan Field office on Finley Road, with an adjacent hangar under construction. “In March 1950, Mr. Morgan was unable to individually bear the burden of the rent costs for the land, then amounting to $1,500 a year. So the local Skyrangers began a subscription drive & raised the money themselves. Albion’s 5 major industries donated funds, as well as numerous merchants. The earliest aeronautical chart depiction which has been located of Morgan Field was on the May 1950 Milwaukee Sectional Chart. It depicted Morgan Field as having a mere 1,800' unpaved runway. it was announced that the Skyrangers were unable to raise all the funds to rent the land for another year, and that the Morgan Field would be closed. The club announced it was selling its plane to pay off a $300 indebtedness on its lease. Apparently, local industries were able to pay their share of the $1,500 annual rental price, but donations from merchants fell short. The Skyrangers also announced that they were disbanding their club at the time. Pleas by the city to keep the field open failed. The National Guard planes were moved to Brooks Field in Marshall. by industrial executives & salesmen coming to visit Albion manufacturing plant offices. Frank continued, “Amberton village, the Bowling Alley, and other enterprises were built on the former airport site, and this unique opportunity was lost forever. Morgan Field was no longer depicted on the 1958 USGS topo map. No trace remained of Morgan Field in a 1998 USGS aerial photo. A 2015 aerial view showed no trace remaining of Morgan Field. 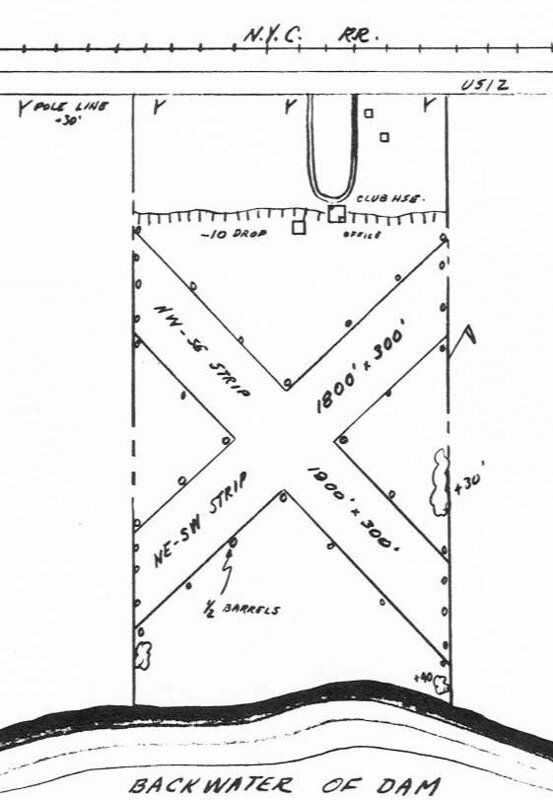 The site of Morgan Field is located southwest of the intersection of Finley Road & Michigan Avenue. 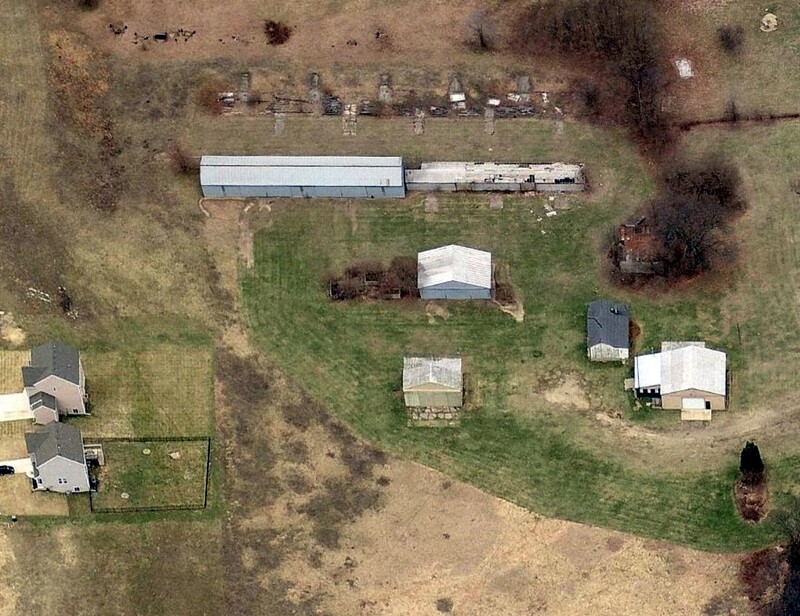 A 4/21/98 USGS aerial view looking southeast at Corunna Airport. Not much is known about this small general aviation airport, including its name or date of construction. or on the October 1993 Detroit Sectional Chart. 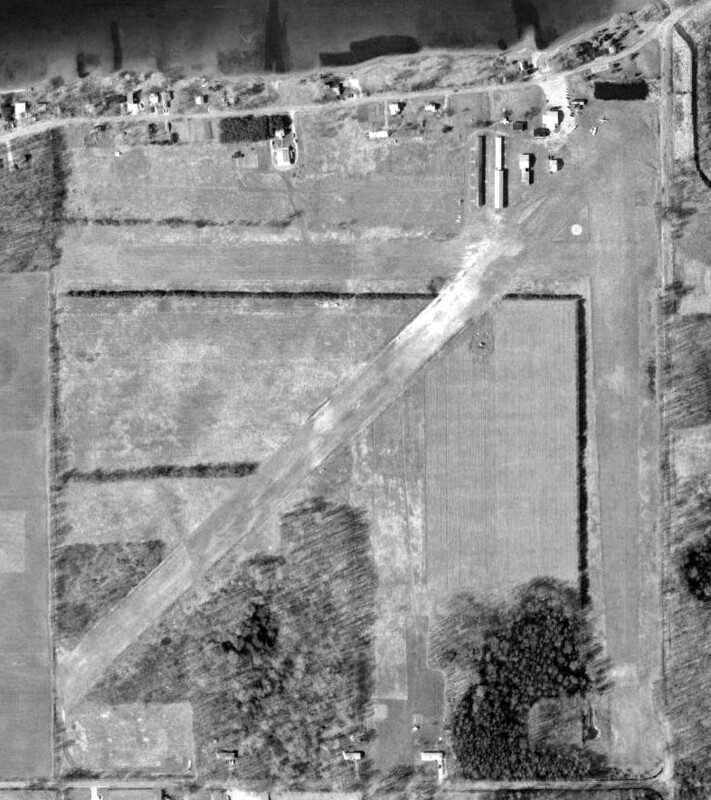 The earliest depiction which has been located of Corunna Airport was a 4/21/98 USGS aerial view. with a few small buildings on the north side of the field. Jason Morford recalled, “The airport was a privately-owned, public [use] airport. 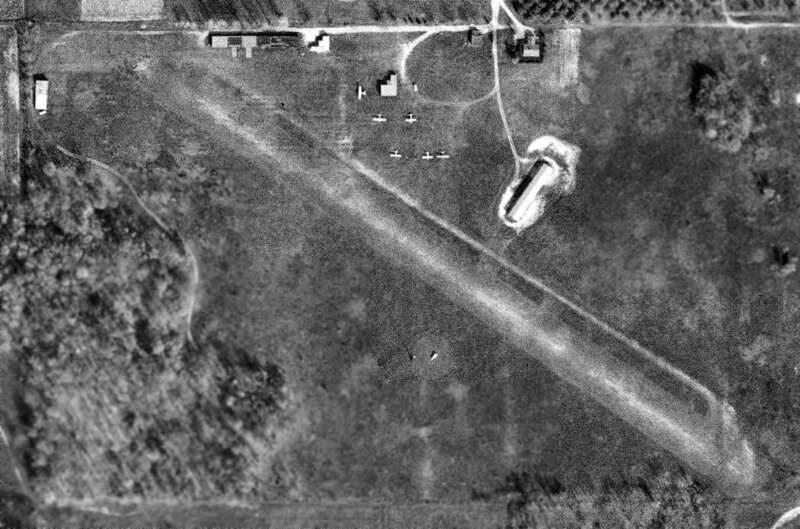 The only photo which has been located showing aircraft at Corunna Airport was a 4/31/05 aerial view looking southeast. It showed 2 light single-engine aircraft parked next to the hangar. 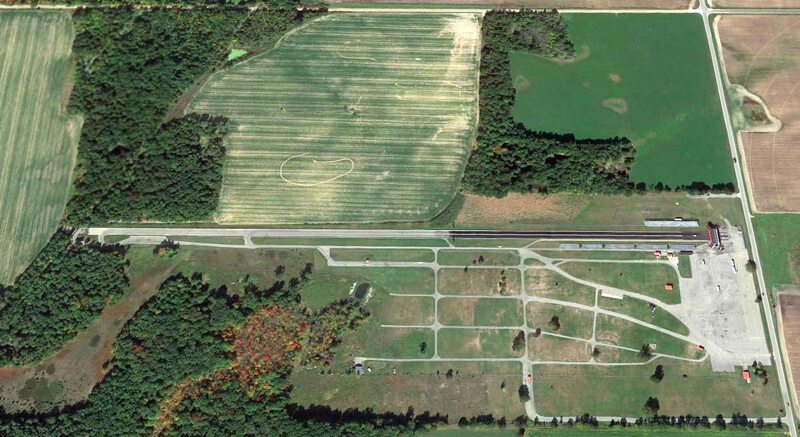 The last photo which has been located showing the Corunna Airport runway appearing to still be maintained was a 5/31/09 aerial view looking southeast. 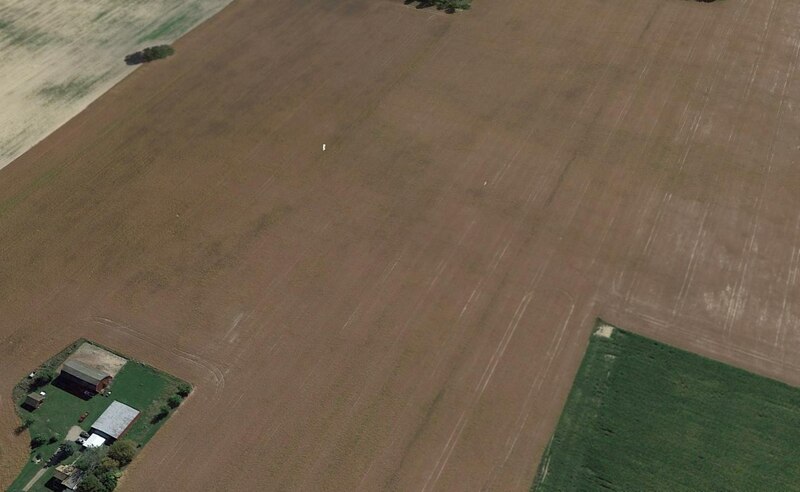 as a 6/1/11 aerial view showed that the runway had been plowed over, but was still somewhat recognizable. although the hangar still remained on the north side of the airport site. As of 2015, street maps still show a single northeast/southwest runway, even though contemporary aerial photos show the runway to be long-gone. The site of Corunna Airport is located southeast of the intersection of Cronk Road & North Reed Road. Thanks to Jason Morford for pointing out this airfield. 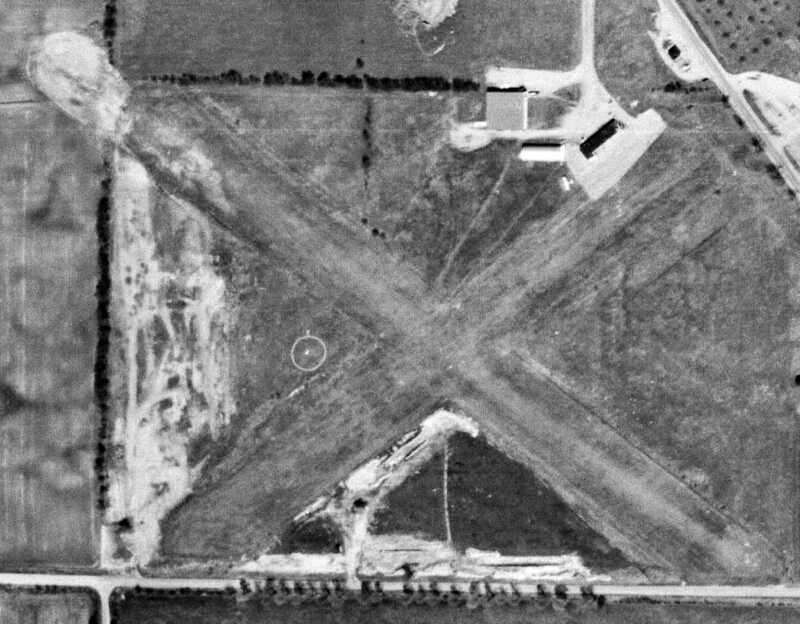 An 11/1/65 USGS aerial view of South Kent Airport. as it was not yet depicted on the 1950 USGS topo map. 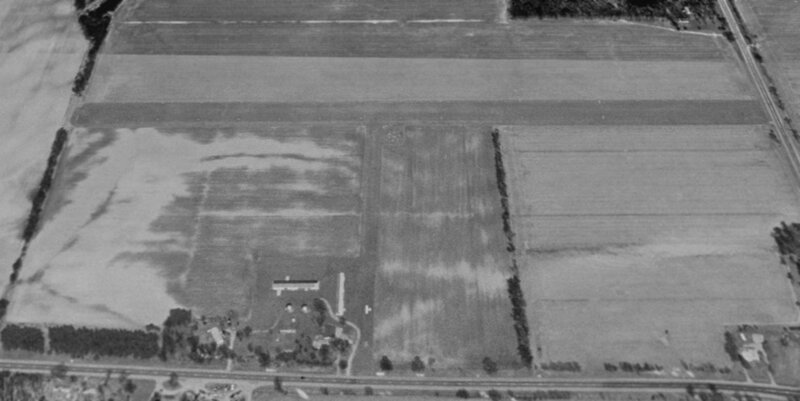 The earliest depiction which has been located of South Kent Airport was an 11/1/65 USGS aerial photo. with several T-hangars & 6 single-engine aircraft on the north side of the field. and several T-hangars on the north side of the field. was on the May 1968 Milwaukee Sectional Chart (courtesy of William Willyard). It depicted South Kent Airport as having a 2,200' unpaved runway. 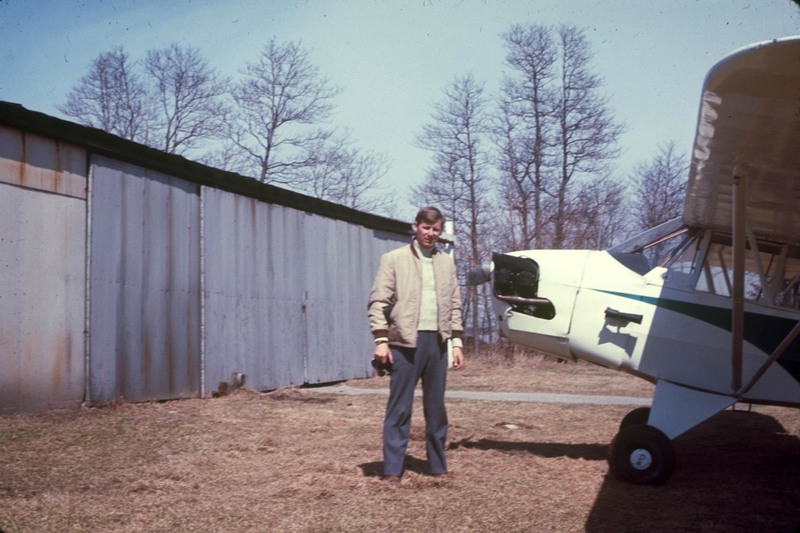 Gary Norton recalled, “South Kent is where I learned to fly in a Cessna 140 [in 1972]. Note it is a bumpy grass strip with a fence at each end of the runway; a tree line & parked airplanes, gas pumps, and buildings next to the runway. This, coupled with a student pilot in a taildragger, should send goose bumps through pilots who understand these parameters. Also, Calvin Molyneux was my father-in-law & an Army Air Force taught, hard-nosed instructor. This scenario was cause for extreme stress on my part. I can’t tell you how many times it took me to learn to takeoff without Calvin’s help. I know he had 3 persons to teach how to fly, and his patience was usually pretty short. Gary continued, “Once we were in the air, we had to learn to land. This is not the case for pilots who have 5,000' long concrete runways. I had to learn how to land on an 1,800', fence-to-fence grass strip. Not only was this a short field, there was a Big Red Barn when turning final for Runway 31. One of the first maneuvers we learned to accomplish was to fly a perfect pattern. I emphasize perfect. Calvin would not allow me to deviate 25' altitude or 0 degree direction. All corners had to be square & distances on the numbers. I had to learn how to slip the Cessna while in final because of the trees & the aforementioned Big Red Barn. Also, the Cessna 140 has a slippery shape & is difficult to slow. Therefore, the landing speed has to be controlled & in a cross-controlled condition, you lose altitude while not gaining speed. I was warned to be careful in a windy crosswind condition, because when you are cross-controlled, you have little room for correction. Once safely on the ground, Calvin warned me to not lose concentration on landing the plane. Gary continued, “South Kent Airport was managed by Roland Palma, and he owned the Fixed-Base Operator, Palma Aviation. 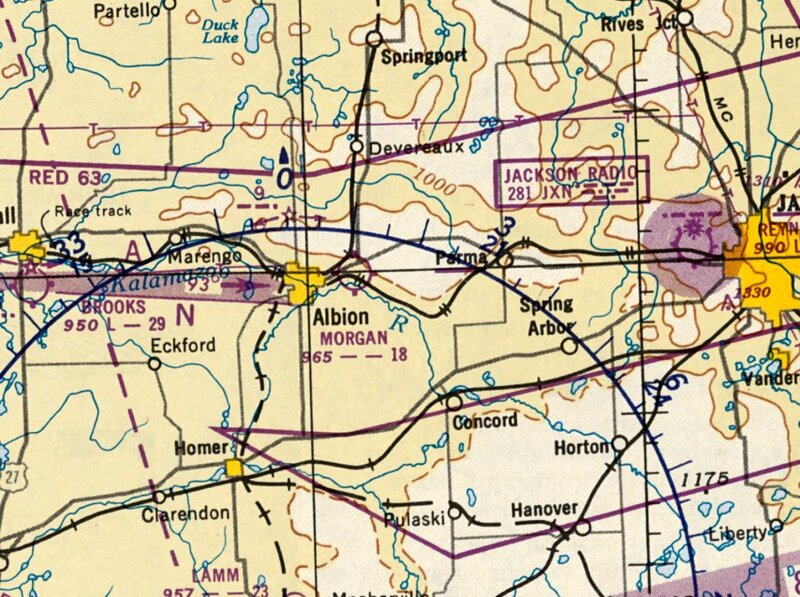 The last aeronautical chart depiction which has been located of South Kent Airport was on the May 1975 Chicago Sectional Chart. It depicted South Kent Airport as having a 2,100' unpaved runway. 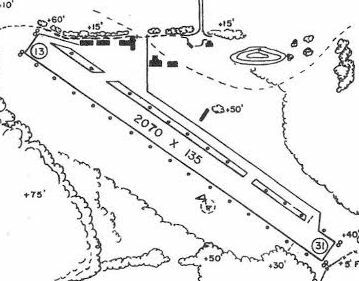 depicted South Kent Airport as having a single 2,070' Runway 13/31, with several small hangars along the north side. The manager was listed as Palma. Unfortunately, it also noted that the airport was scheduled for closure in the Summer of 1989. 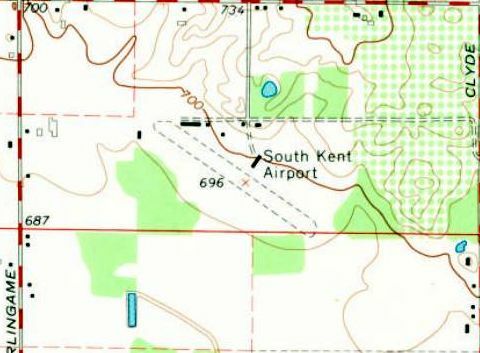 The 1991 USGS topo map continued to depict South Kent Airport. with no recognizable trace remaining of the small airport. 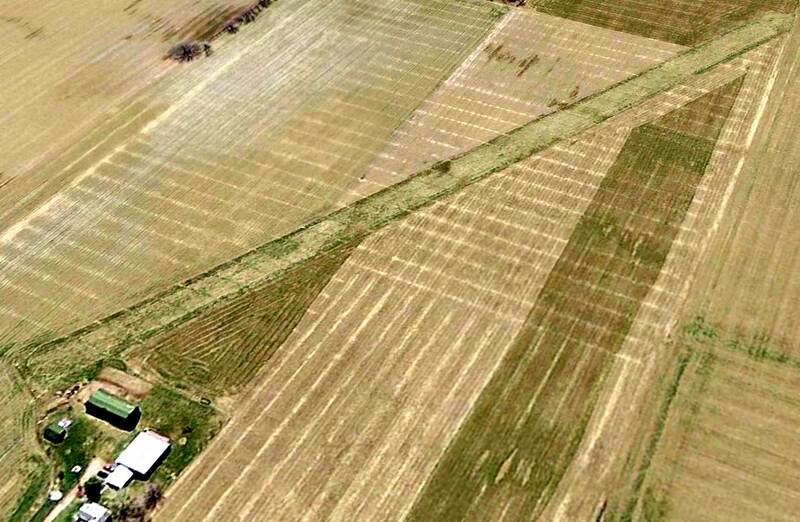 An 8/22/13 aerial view showed no trace remaining at the site of South Kent Airport. including Airfield Drive & Runway Drive. Thanks to Gary Norton for pointing out this airfield. 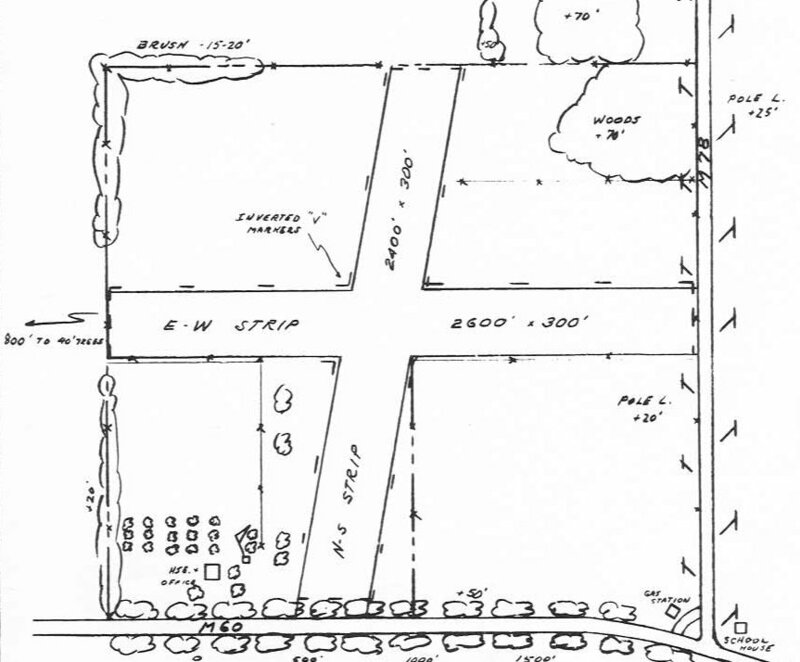 Hillsdale Airport, as depicted on the May 1942 Chicago Sectional Chart (courtesy of Chris Kennedy). 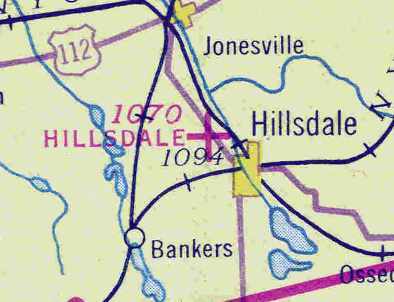 The original Hillsdale Airport was located adjacent to the northwest side of the town. was in the Airport Directory Company's 1938 Airports Directory (courtesy of Chris Kennedy). 1,900' northwest/southeast & 1,800' northeast/southwest. was on the May 1942 Chicago Sectional Chart (courtesy of Chris Kennedy). 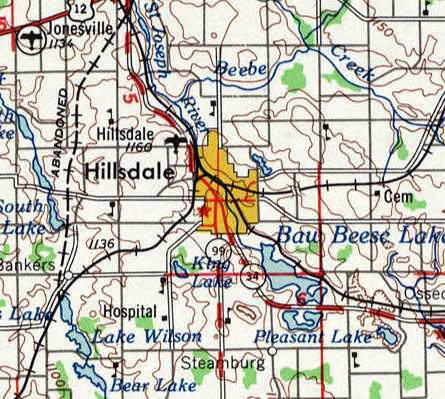 It depicted Hillsdale as an auxiliary airfield. 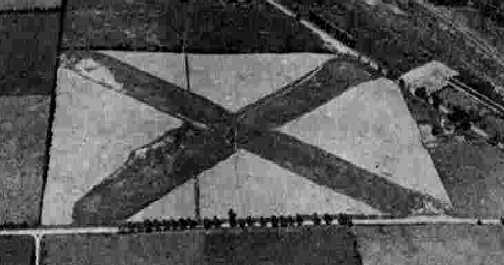 It depicted Hillsdale as having 2 grass runways in an X-shape. described Hillsdale as having a 1,900' unpaved runway. as a 50 acre irregularly-shaped property within which were 2 gravel & sod runways: 1,900' northwest/southeast & 1,800' northeast/southwest. 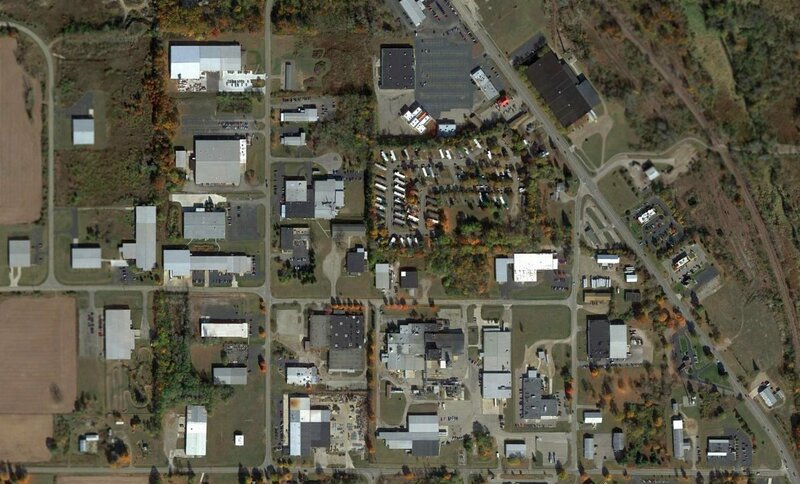 to be owned by the City of Hillsdale, and to be operated by private interests. one evening late in the Fall of 1945, a group of 75 or 80 aviation & flying enthusiasts met to talk about organizing a Hillsdale Aviation Club. The first president of the new organization was Bernard "Bud" Richard, an experienced pilot & flying enthusiast. During the first year, the monthly meetings were devoted to planning & financing a clubhouse for a meeting place. and with the exception of 2 years, this has become an annual event. while the members held "work bees" doing all the labor required to build a modest sized office, meeting room, and restrooms. The earliest operator was Lloyd Brown, with Guy Pearce as instructor. He was followed by Francis Clymer & Russell King. was in the 1946 MI Airport Directory (courtesy of Doug Ranz). with a hangar & office at the northeast corner of the field. showed 2 single-engine aircraft next to a ramp with 2 hangars, on the north side of a grass airfield. Many of the students at Hillsdale were veterans, using their benefits to pay for flying lessons. When this source of revenue began to dry up, no one wanted to manage & operate the airport. and agreed to keep telephone, restrooms & a supply of gasoline available. By the late 1950s the inadequacy & poor approaches of the "old" field become more & more apparent. 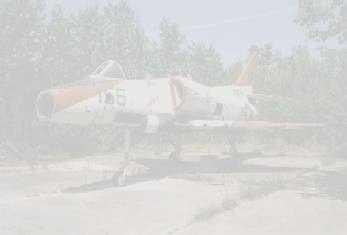 which depicted only 1 single-engine aircraft visible parked outside on the north side of the field. with 2 buildings on the north side. as having 2 sod runways (1,900' Runway 13/31 & 1,800' Runway 4/22). 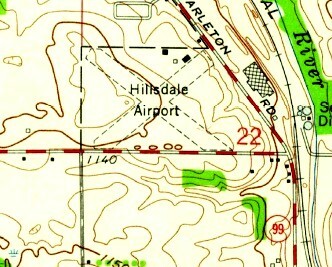 The last depiction which has been located of the original Hillsdale Airport was on the 1962 USGS topo map. as only the new field was listed in the 1963 AOPA Airport Directory (according to Chris Kennedy). 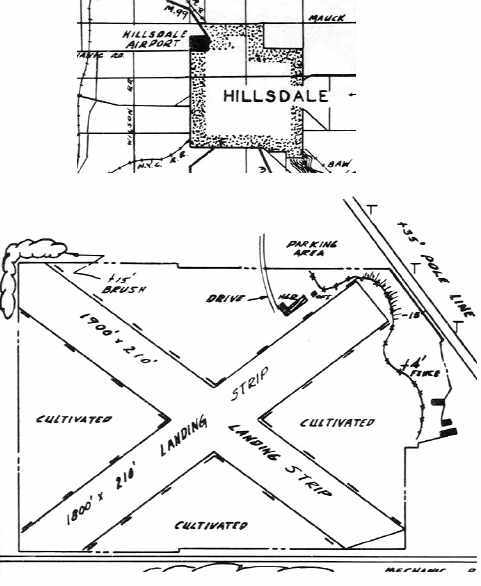 The property of the original Hillsdale Airport was sold & was eventually redeveloped as an industrial park. 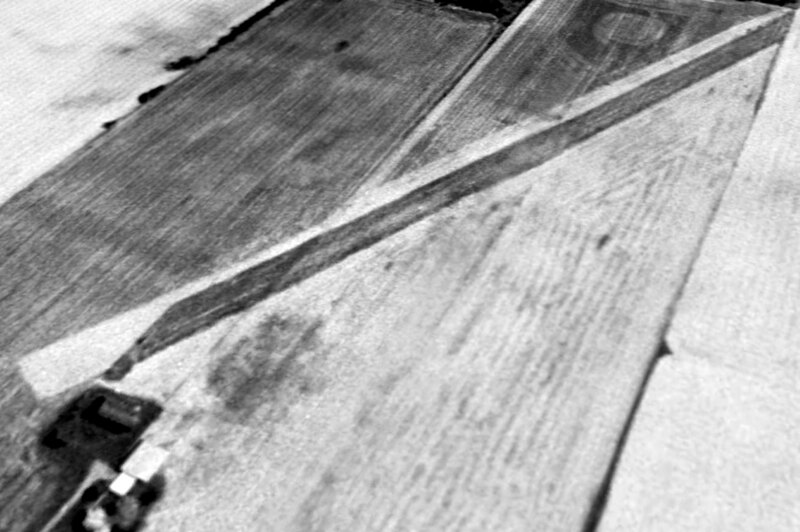 A 2015 aerial photo showed no obvious traces of the original Hillsdale Airport appeared to remain. the row of trees running southeast from the center of the photo matches the southern edge of the former northwest/southeast runway. The site of the original Hillsdale Airport is located northwest of the intersection of Route 99 & Mechanic Road. Thanks to Michael Goble for pointing out this former airfield. 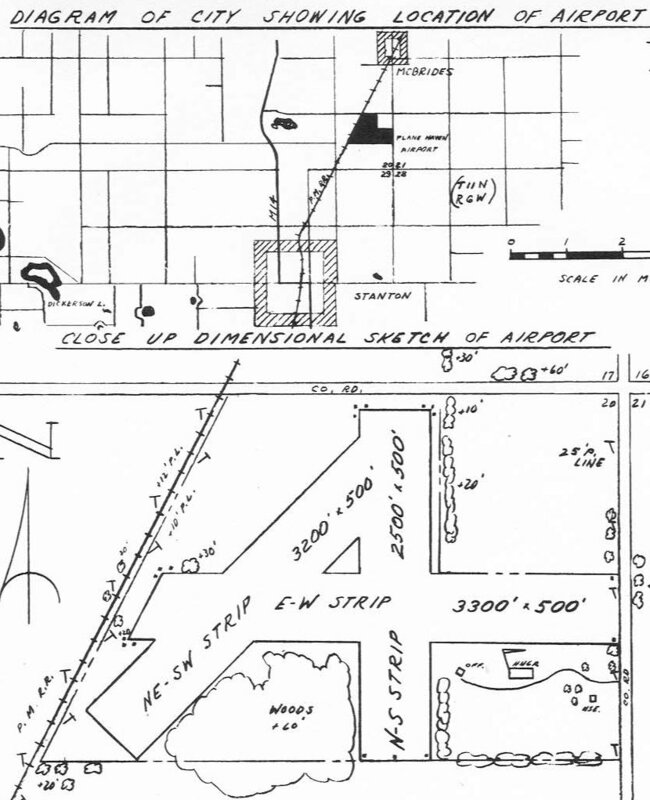 Grand Rapids Airport, as depicted on the June 1931 Milwaukee Sectional Chart. groundbreaking for Kent County's first airport took place in 1919, on a site 4 miles from downtown Grand Rapids. The United States' first regularly scheduled airline service began in 1926, between Grand Rapids & Detroit. In 1927, Charles Lindbergh landed the Spirit of St. Louis at Kent County Airport. This visit came only a few months after his historic New York-to-Paris flight. With an infusion of federal funds, the airport took on a new look in the 1930s. WPA money was used to remodel the Administration building & build a new restaurant. In 1930, the Kent County Board of Supervisors appointed one of its own, Tom Walsh, to manage the airport. Tom Walsh's years of service to the airport would span almost 30 years & leave a lasting legacy. 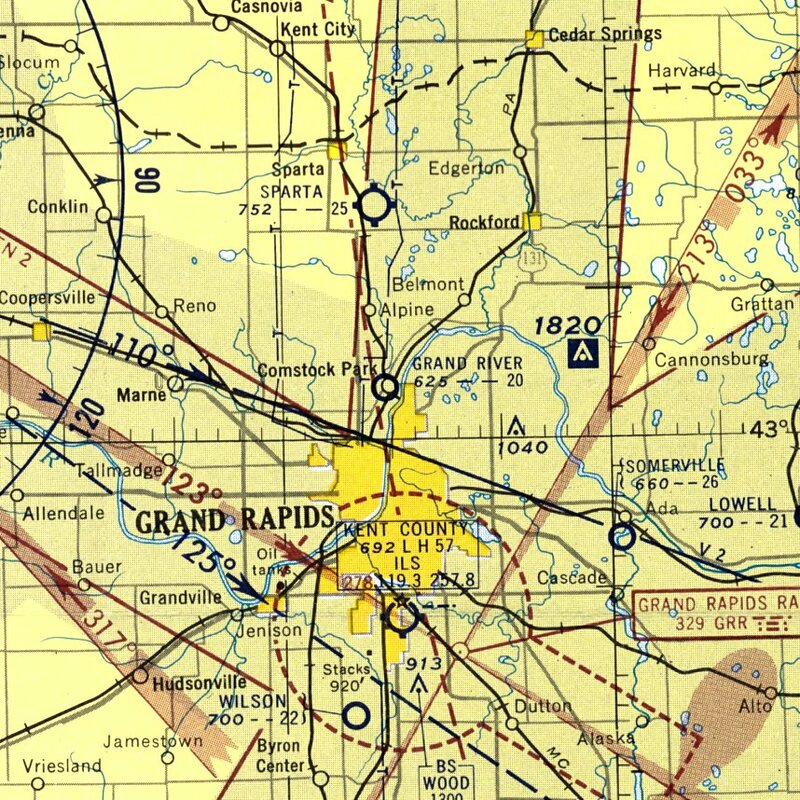 The earliest depiction which has been located of Grand Rapids Municipal Airport was on the June 1931 Milwaukee Sectional Chart. 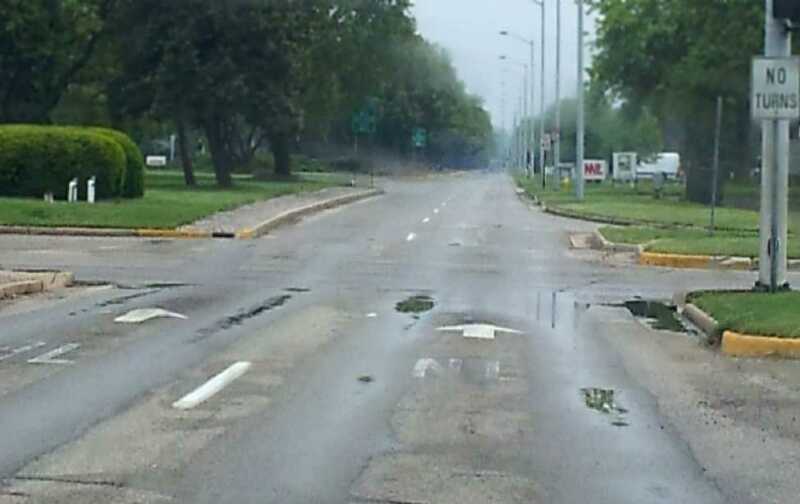 The directory described Grand Rapids Municipal as having two 2,900' asphalt runways. The aerial photo depicted a ramp with several hangars. and the operators were listed as Furniture Capitol Air Service & Kohler Aviation Corporation. with the longest being the 2,700' northeast/southwest & northwest/southeast strips. 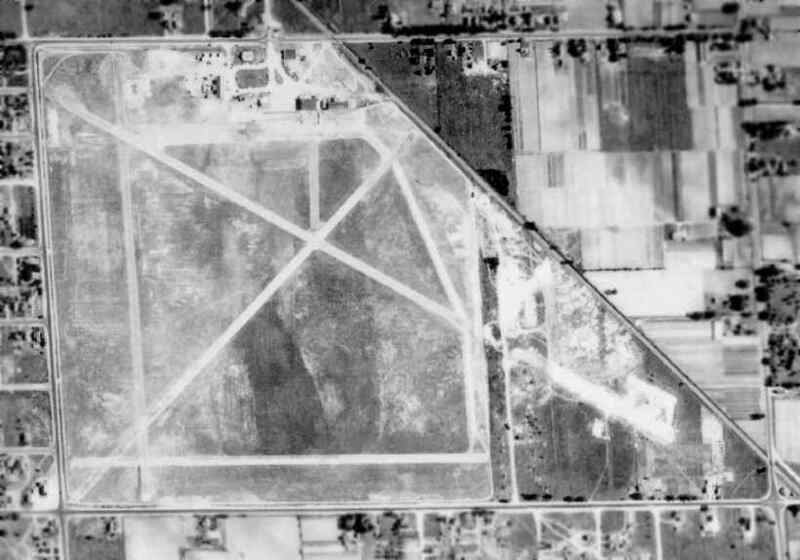 shows the field's preWW2 configuration, with a number of runways in a roughly square-shaped plot of land. into a newly annexed plot of land to the southeast. An undated photo of the new Administration building, which was completed in 1939. It boasted the very latest heating, lighting, plumbing, and all modern conveniences of the time. The building's 24" thick, steel-reinforced concrete walls were built to be "bomb proof". 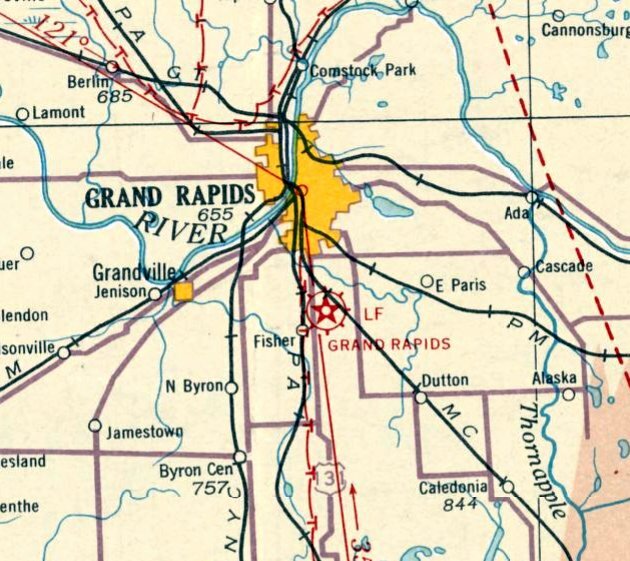 In 1940, Grand Rapids was one of only six American cities boasting scheduled air service north, south, east, and west. WW2 military needs in the early 1940s led to the addition of several buildings at the airport. the airport was a useful place early in the war to train transport pilots & to conduct training exercises. The first pilot cadet training program in Michigan began at Kent County Airport in 1942.
at the field over the next 2 years. A 9/12/43 aerial view looking north at Kent County Airport from the 1945 AAF Airfield Directory (courtesy of Scott Murdock). with the longest being a 4,420' northwest/southeast concrete strip. and to be owned & operated by Kent County. with the longest being the 4,400' southeast/northwest runway. 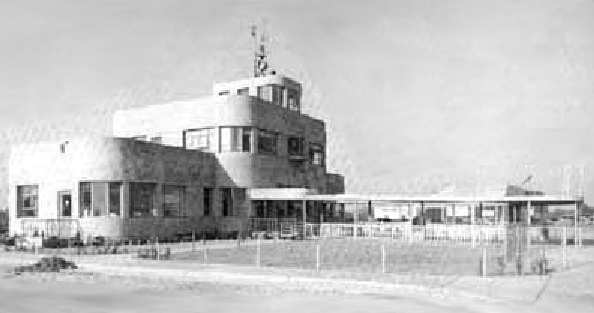 and in 1947 a new $60,000 control tower began operating atop the Administration building. 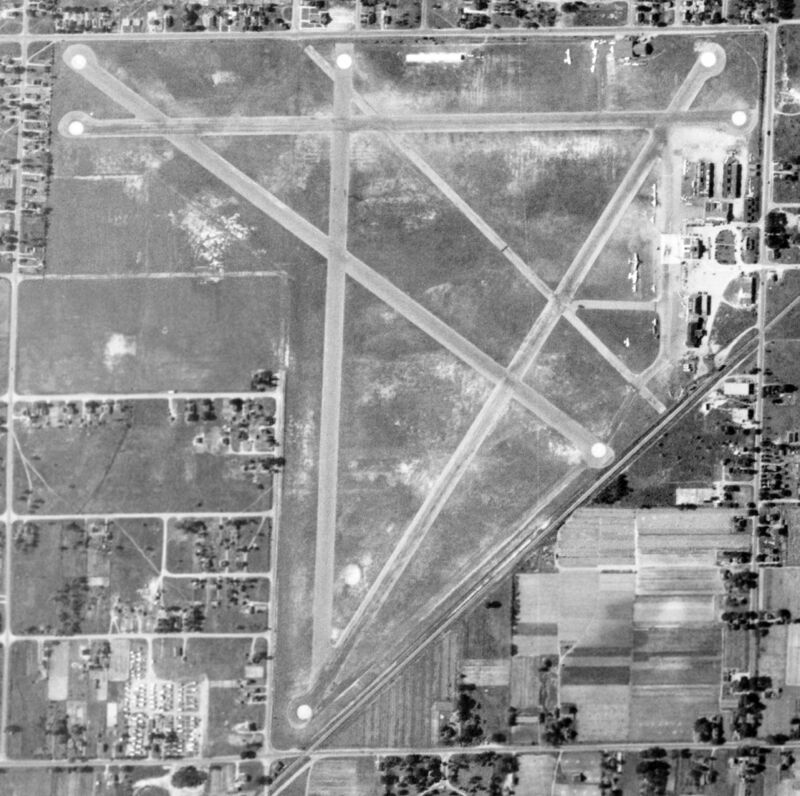 A 10/14/47 USGS aerial view looking depicted Kent County Airport as having 5 paved runways, with a large number of aircraft parked near hangars on the northeast corner. from the back cover of the 1948 Lear Annual Report. A V-tail Bonanza & a Beech 18 are parked in front of the hangar marked “Lear Service”. as having a 4,400' paved runway. which would require the purchase of 120 acres & 89 houses. A colorized circa 1940-50s photo of a DC-3 unloading in front of the Kent County terminal. In early 1952 the newly expanded 5,700' runway was completed. from crossing the airport's longest runway while planes were taking off & landing. 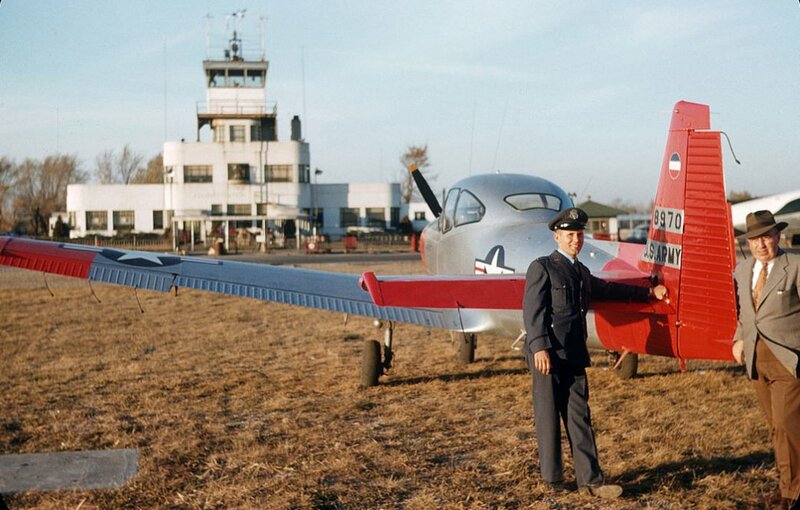 A 1952 photo (courtesy of Mike Denja ) of Lt. Don Connor & Bob Rogers & a Ryan L-17 Navion in front of the Grand Rapids control tower. Tom Sieswerda recalled, “The old Grand Rapids Airport... I learned to fly there. I met Bill Lear when he had a hangar on the West side of the airport. I was in the tower one day when Arthur Godfrey landed there. The controllers let me ride my bike across the northwest corner of the airport, giving me light signals. I pulled up to his DC-3 (beautiful silver with maroon & green trim) as he was getting off. We talked awhile then after he hit the restroom he invited me onboard. He introduced me to his copilot then asked if I thought my parents would be OK if I went on a little flight. Well, you know my answer. After they fueled I watched the starting procedure & the taxi to Runway 4. For takeoff, I was in the bulkhead seat on the right. After we were up, Arthur asked to point out my house which we circled. Then over my high school & downtown. We turned West toward Grand Haven on Lake Michigan. We turned South along the coast. The copilot got up & offered me his seat. He pointed out the altimeter & said to keep it at 3,500 feet. That worked for a while until I had to push forward on the wheel to keep altitude. I had seen the trim wheel so I rolled it forward. OK for a while until I had to trim it up. I was confused until the copilot came up front & he and Arthur busted out. with the new concrete Runway 18/36 extending over a significantly larger plot of land toward the south. 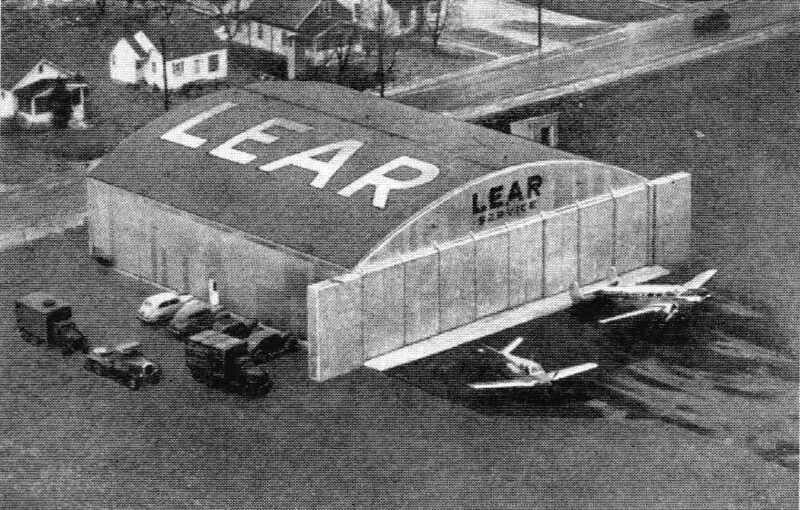 as well as another small hangar marked with "Lear" on the southwest side of the field. but the buildings had not yet been constructed. By 1956, increased air travel resulted in the airport again bursting at the seams. to expand & improve the existing airport or to start over on a new site. 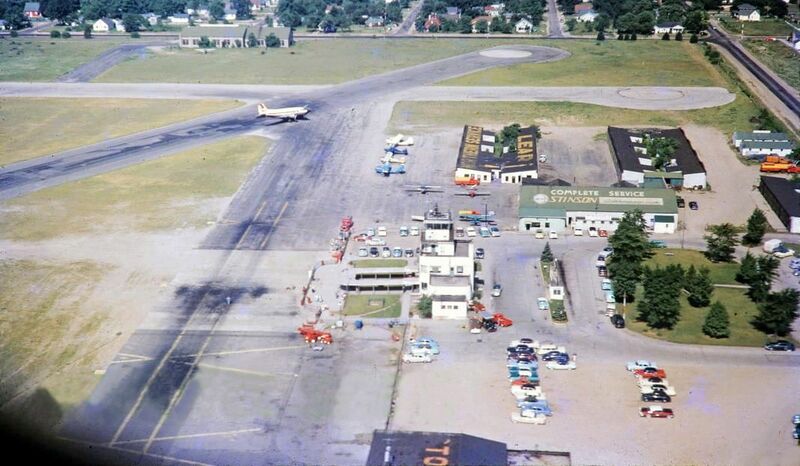 A circa late 1950s aerial view looking west at the northwest corner of Grand Rapids Municipal Airport (courtesy of Dave Thompson). Dave Thompson observed, “The photo is looking west at the north end of Runways 18 & 12, with the terminal building in the foreground and the 'new' Lear hangars further west. 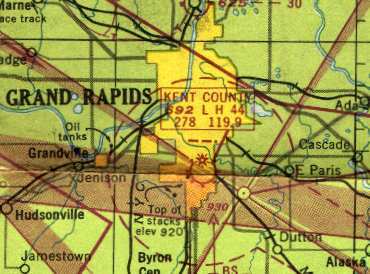 Kent County Airport, as depicted on the 1958 USGS topo map. 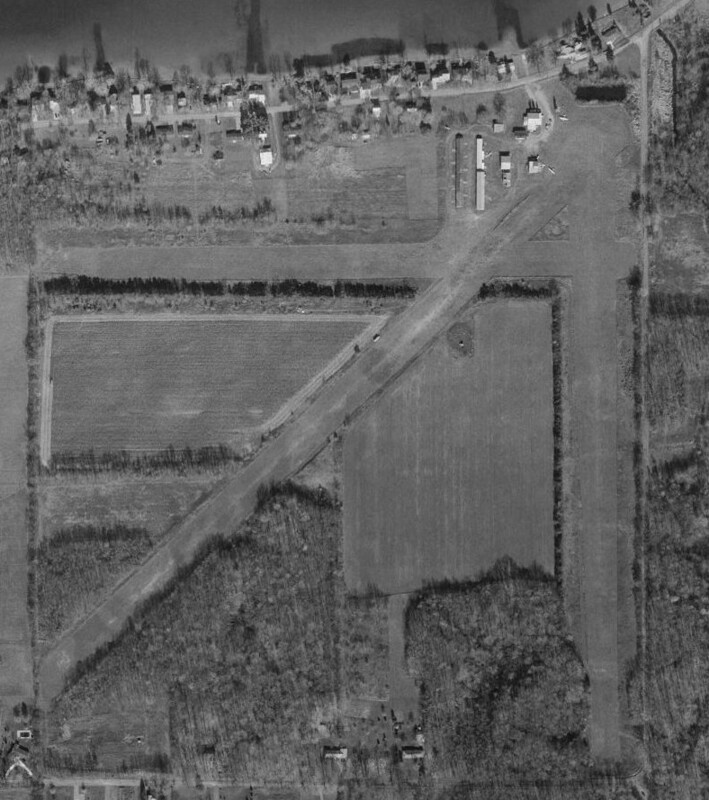 In 1958 the decision was made to replace the original Kent County Airport with a newly constructed field in eastern Cascade Township. 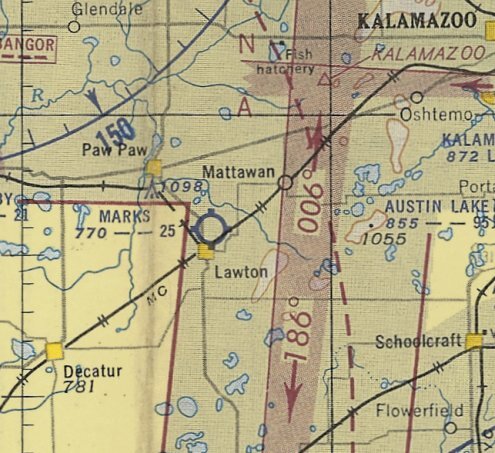 The last aeronautical chart depiction which has been located of Kent County Airport was on the May 1960 Milwaukee Sectional Chart. It depicted Kent County Airport as having 5 paved runways, with the longest being 5,700'. The groundbreaking for the replacement Kent County Airport was conducted in 1961.
to Chicago many times as a youngster in the 1960s. My father also flew in North Central DC-3's out of the airport as well." the original Kent County Airport was in its final year of operation. a 4,400 asphalt Runway 12/30, and a 3,400' asphalt Runway 4/22. and airline service was listed as being provided by Lake Central, North Central, and UAL. taken only a few months before the field closed. as well as the newer concrete Runway 18/36 which extended toward the south. "You can see where the long runway crossed 44th Street & they closed gates to let planes land & take off. The taxiway to the east off the long north/south runway went to the Lear plant." It was evidently a facility of Bill Lear, who went on to produce the Lear Jet. and the original Kent County Airport closed in November 1963 (according to Grand Rapids resident Tom Byle). 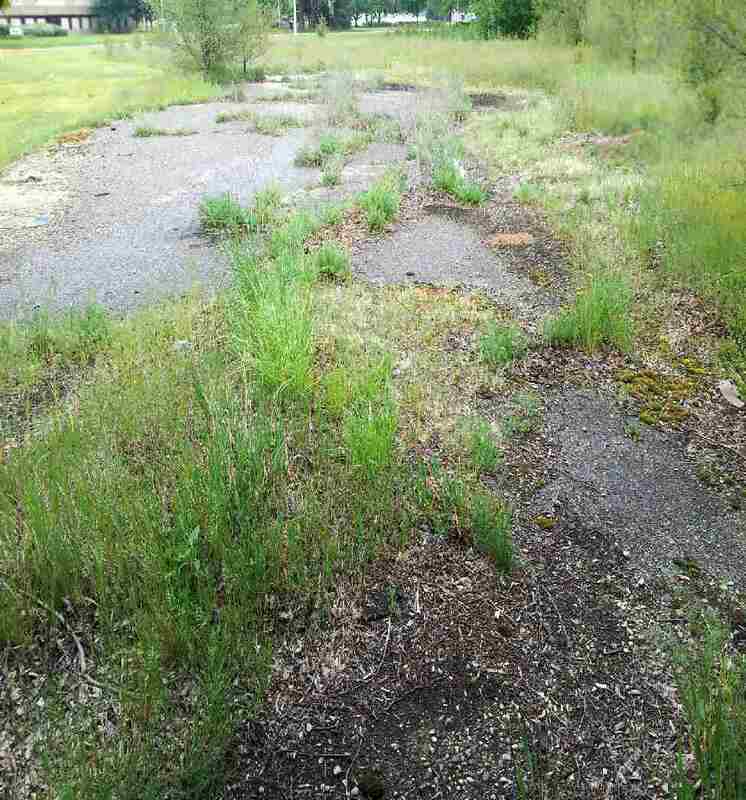 the site of the original Kent County Airport was labeled as "Abandoned airport". 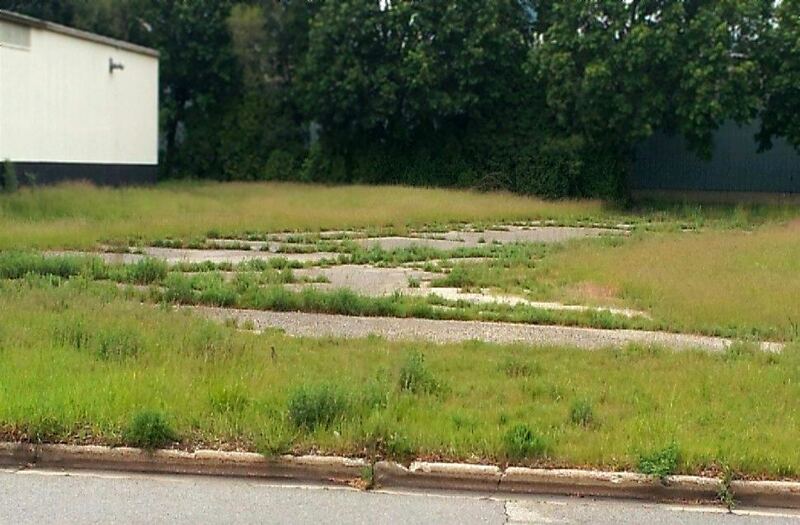 but were demolished to make way for the industrial park." The site of the former airport was labeled "Kent Industrial Center on the 1981 UGSS topo map. USAF Lt. Col. Mark Bailey observed, "The old airport now is an industrial park. I last saw it 20 years ago [in the 1980s] and some pavement still existed." Grand Rapids resident Tom Byle reported in 2004 that none of the original airfield buildings or hangars still exist. An April 2012 photo by Andrew Roberts, of “Roger B. Chaffee Boulevard at 36th Street, which was the large north/south runway. 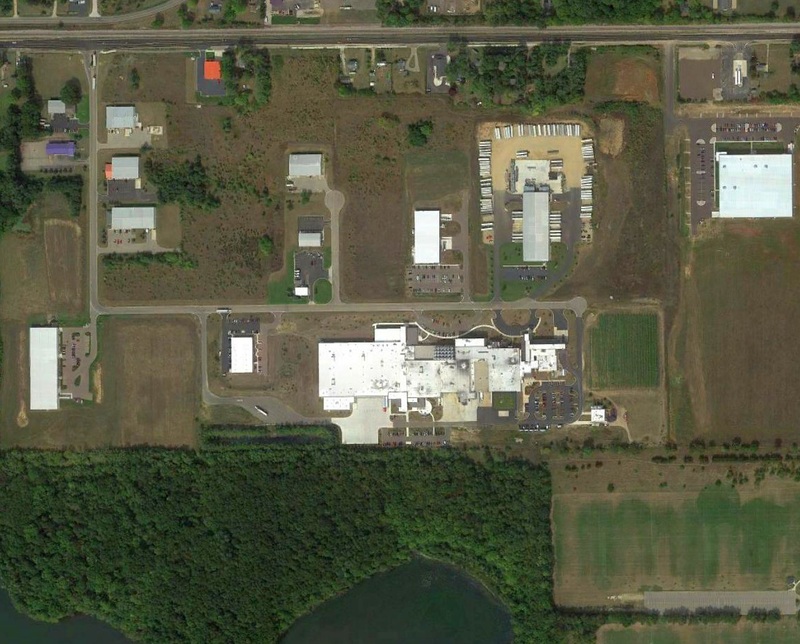 As can be seen in a 2016 aerial view looking northeast, the site of Kent County Airport has been heavily redeveloped with industrial buildings. However, more than half of the former runways have been reused as streets or industrial backlots. The most obvious of these is the former Runway 18/36 & its parallel taxiway, which have been reused as a street - Roger B Chaffee Memorial Drive SE. 44th Street Southeast to the south, and 32nd Street Southeast to the north. Thanks to USAF Lt. Col. Mark Bailey for pointing out this former airfield.